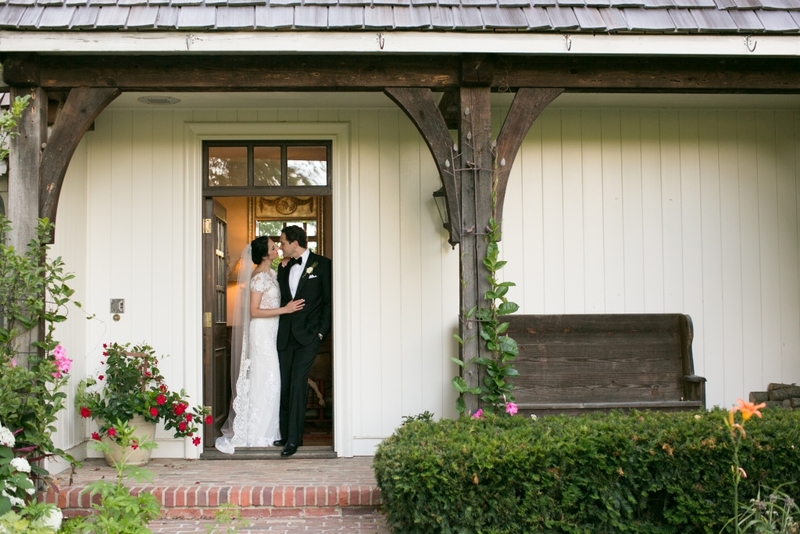 Guests entered the house and were immediately filled with the effervescent spirit and love of family. 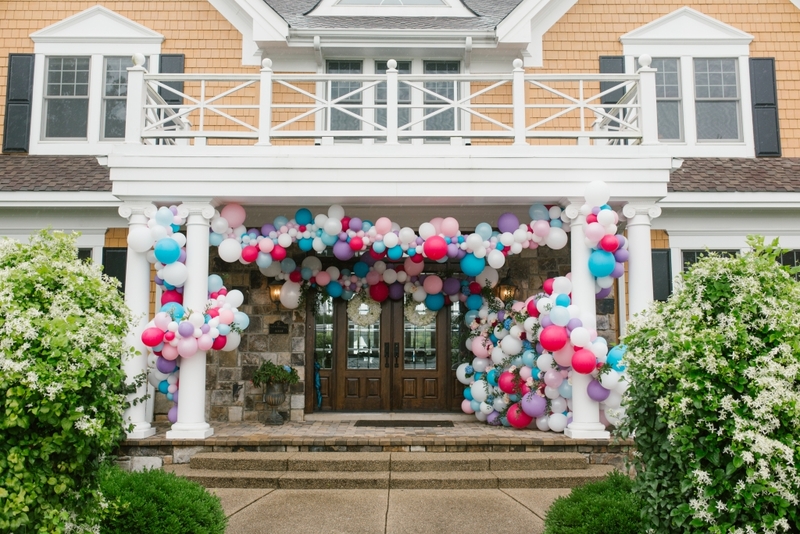 Mead’s brothers greeted their guests surrounded by a bubbling display of balloons at the front door and welcomed guests to the home before escorting them to the backyard service. Mead and Henry’s day’s filled so many smiles and memories and undoubtedly will be a wedding that will forever fill my heart. 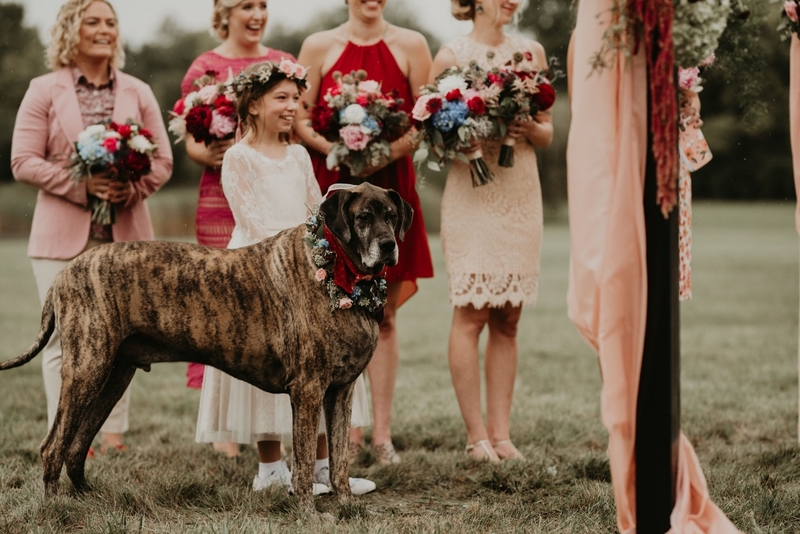 They had truly my favorite ring bearer of all time – a lovable (and large) Bruce Wayne the Great Dane that made every visit I had to their home a treat. 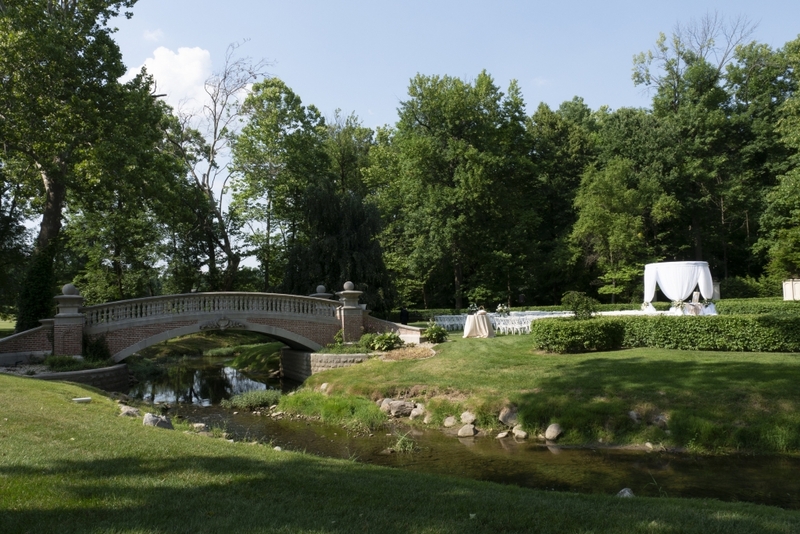 The entire wedding was planned to be outside behind Mead’s parent’s home, and the brunch reception under a gauzy tent filled with colorful florals and lush textures. Hurricane Michael had other plans. 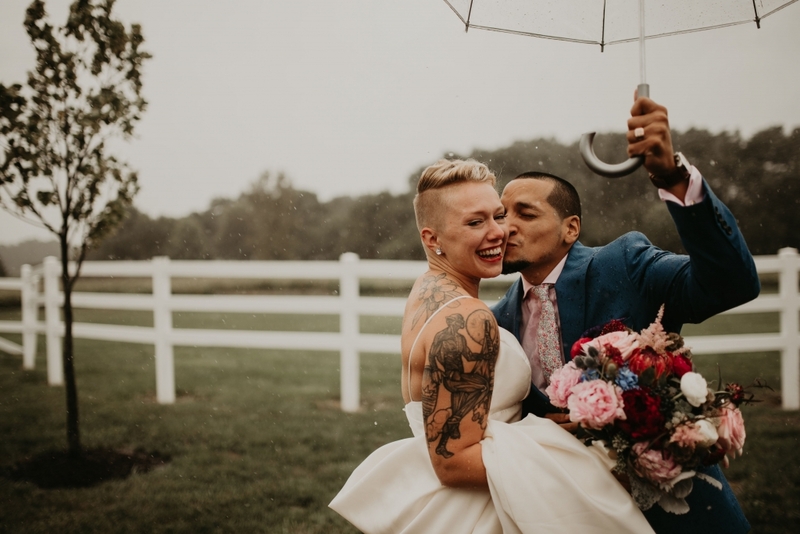 (yes… a hurricane here in Indiana) I promised Mead if I had a 15 minute window of no rain I’d host her ceremony outside (vs under the brunch tent.) 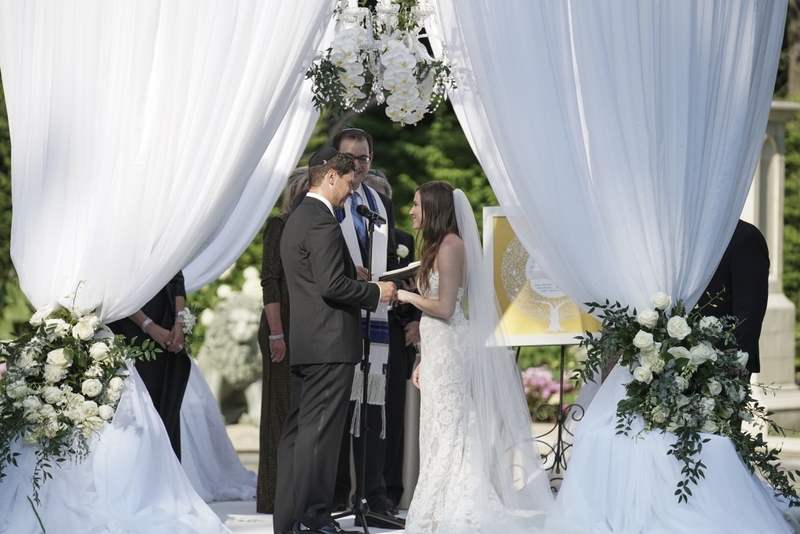 For 23 minutes the skies stopped and we slid in her ceremony… readings, songs and all. 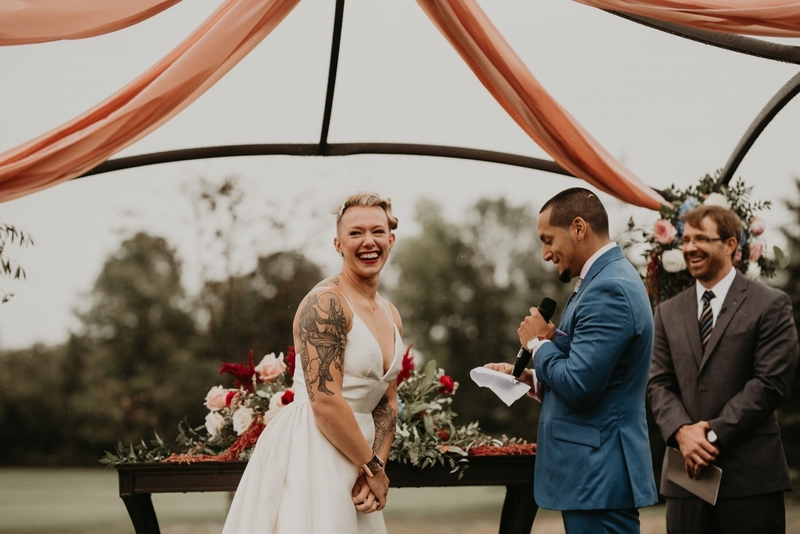 Her ceremony lasted more than 23 minutes, but I truly don’t think Mead and Henry’s guests cared. 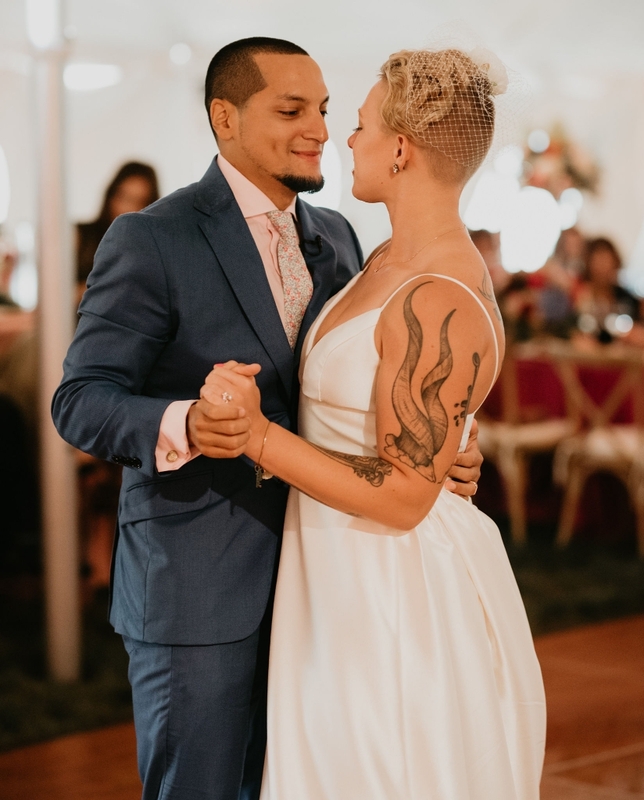 They were there to see these two enormously happy souls get married and the ceremony was filled with SO much joy and gladness that even the rain didn’t make anyone go under the tent until it was time for the abundant meal. 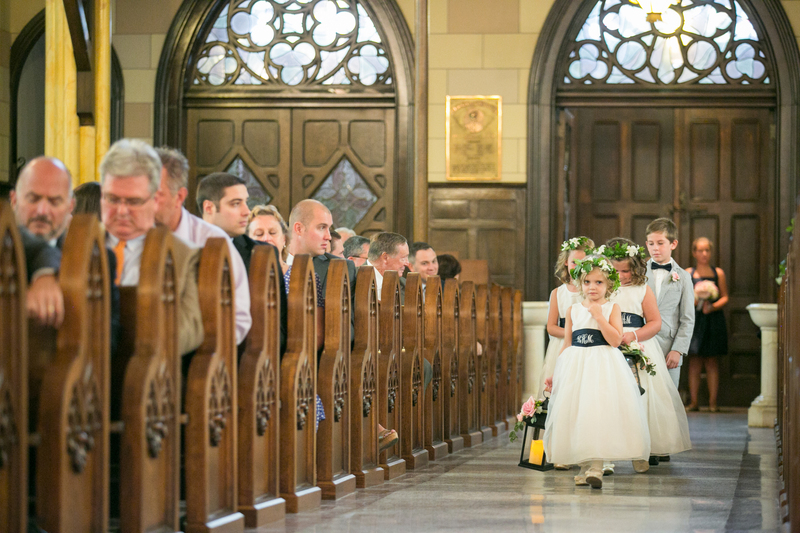 Even everyone’s favorite ring bearer stood with absolute devotion the entire service, only barking once – almost on cue. 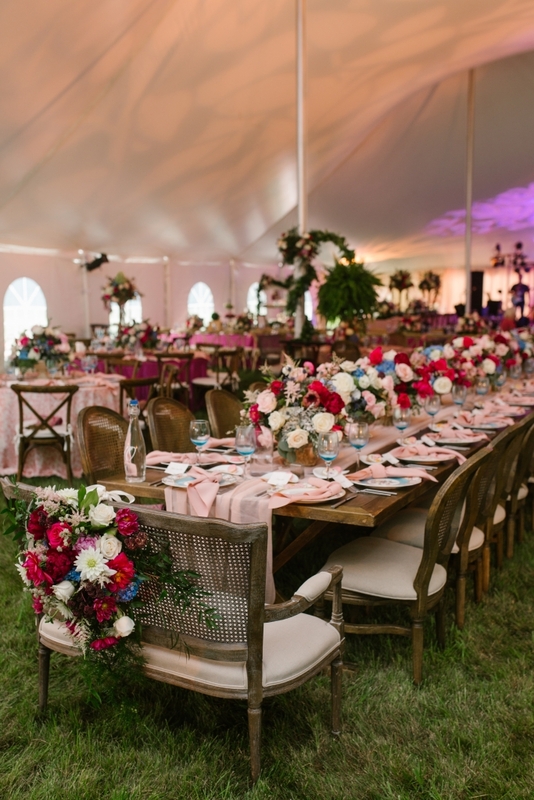 Once inside the tent, the details of the tables were astonishing! On a day without sun, the tent seemed to be filled with sunlight and rainbows all because of the lighting and gardens of flowers. Every once in a while as a planner you hit the client jackpot. So let me just say, JACKPOT!!! I cannot even begin to describe the amount of love I have for Christine, Ryan and both of their families. There is something them, that when you instantly feel welcomed as a member of the family the moment you meet. From the moment I met Terri, Christine’s mom, (in a thunder storm of Biblical proportions) I thought “This woman is so full of radiant sunshine, if I am not selected as their wedding planner, I’m going to have total facebook envy stalking their planner the night of their wedding.” Thank God they selected me as their planner, because Christine and Ryan are the definition of the perfect client. They are as beautiful on the inside as the outside and they entirely trusted every.single.member of their professional team implicitly. Jackpot! 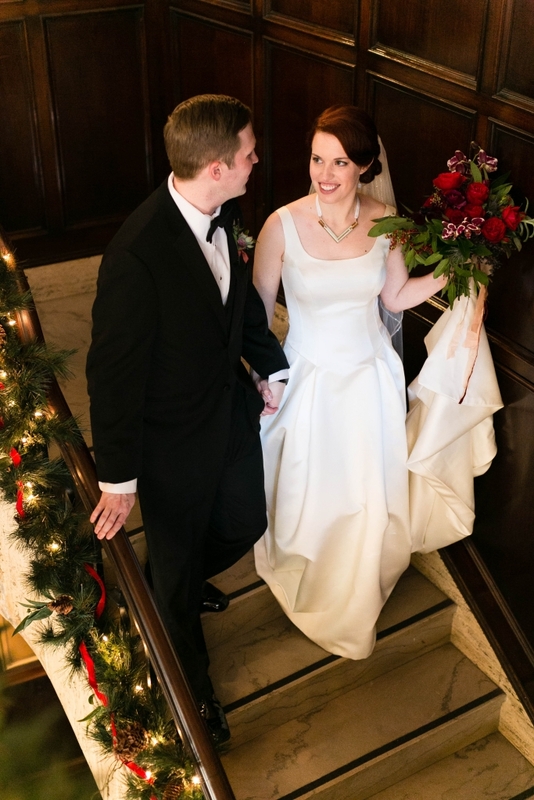 Christine and Ryan were so trusting when it came to the decision making process. 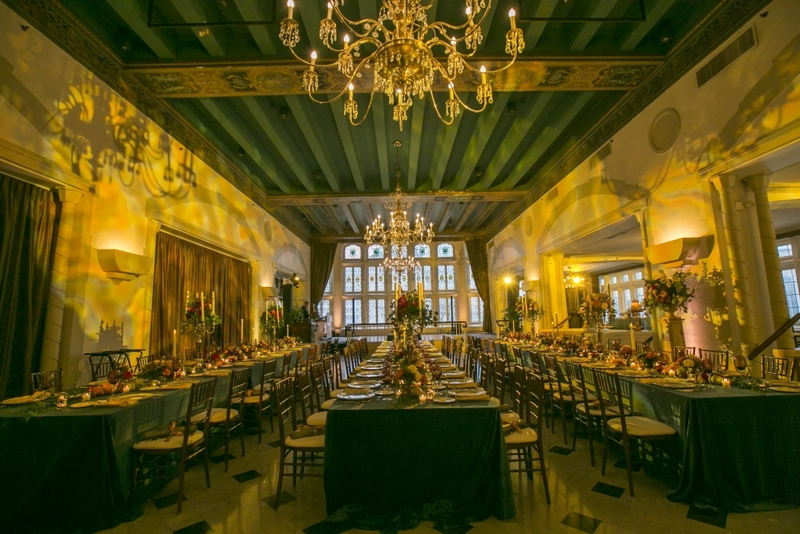 This allowed for the professional team to really all work together to create such an amazingly gorgeous event! 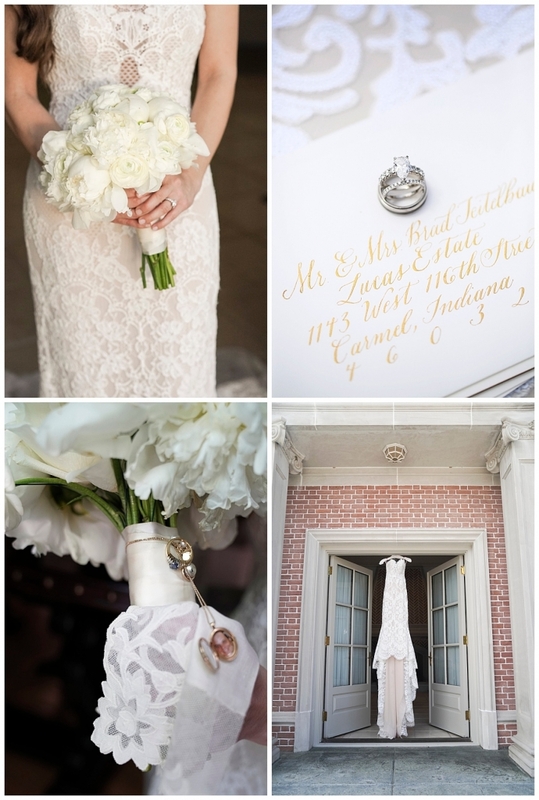 When Christine came to me she already knew that she wanted to use cream and white as her main décor colors. When she tossed in an inspiration incorporating palms (which — shhhhh 😉 — Ryan was not initially crazy about), my heart skipped a beat! 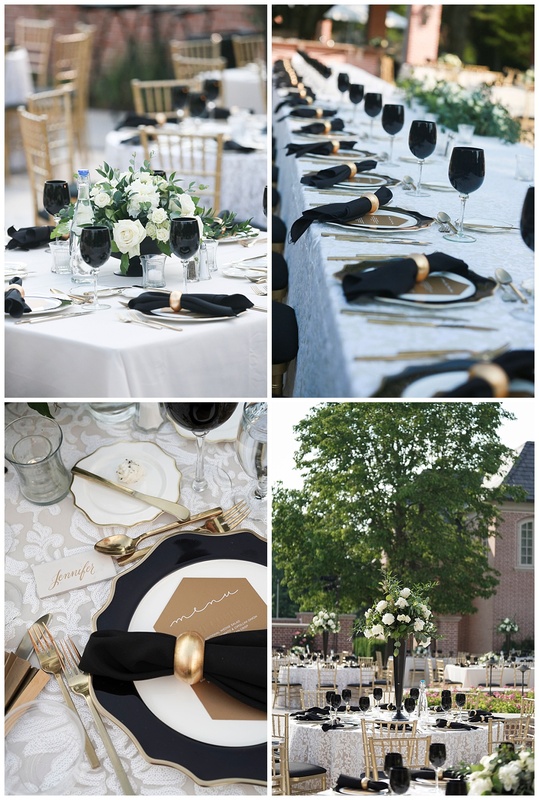 Using the inspiration of Old Hollywood and the classic hues of whites, golds, and blacks with the vibrant pop of the palm leaves created the perfect touch of whimsy! 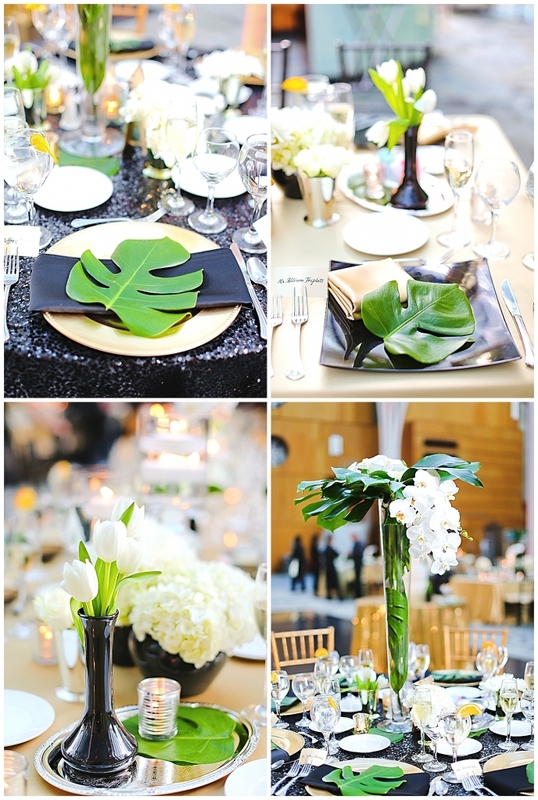 Placing a palm leaf on each place setting was a fun way for each guest to be able to take home a piece of the event and it also added a fun aspect of depth to the tablescape. 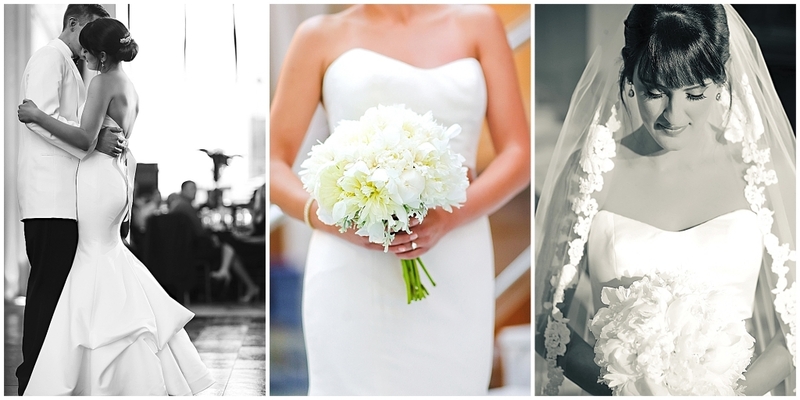 The flowers were hundreds of bouquets of white clustered flowers. 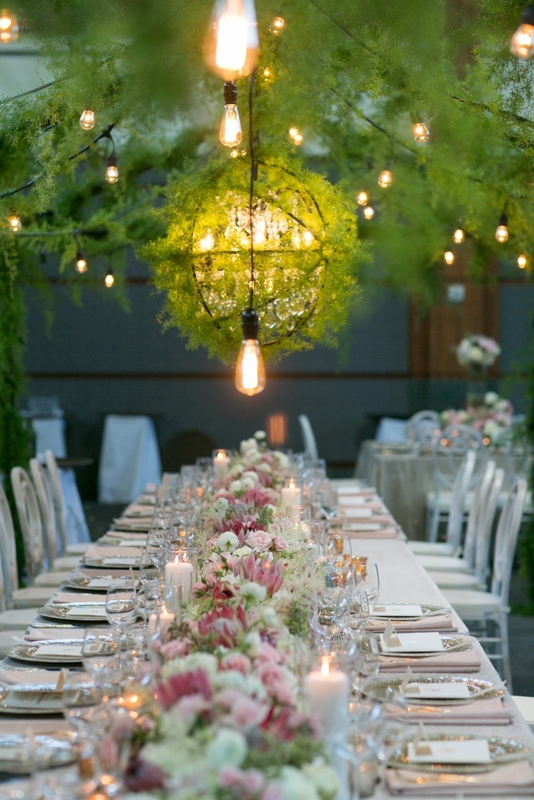 Peony, tulips, roses, hydrangea and orchids filled the tables with fragrance and romance. Antique trays were layered with the monstera leaves to create little vignettes on the table tops for the cream and sugar reminiscent of a bygone era. 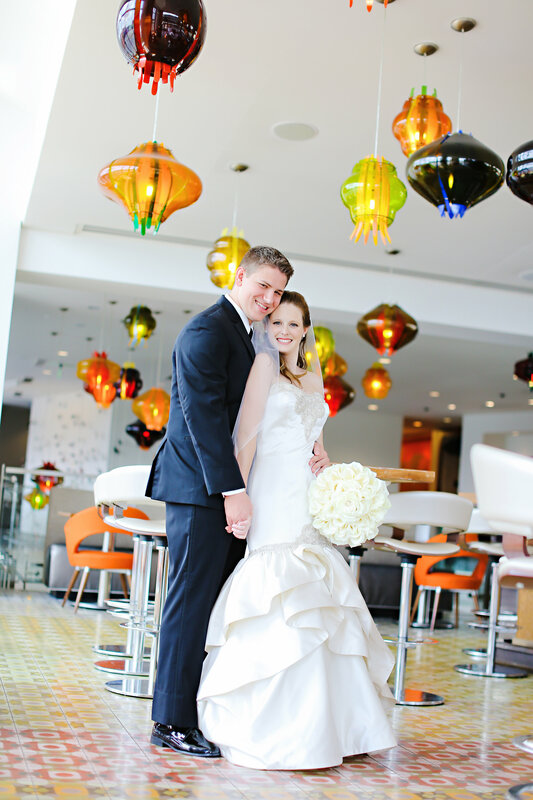 Christine and Ryan’s kindness showed not only the their reception guests, but also to the staff at Riley Hospital for Children. 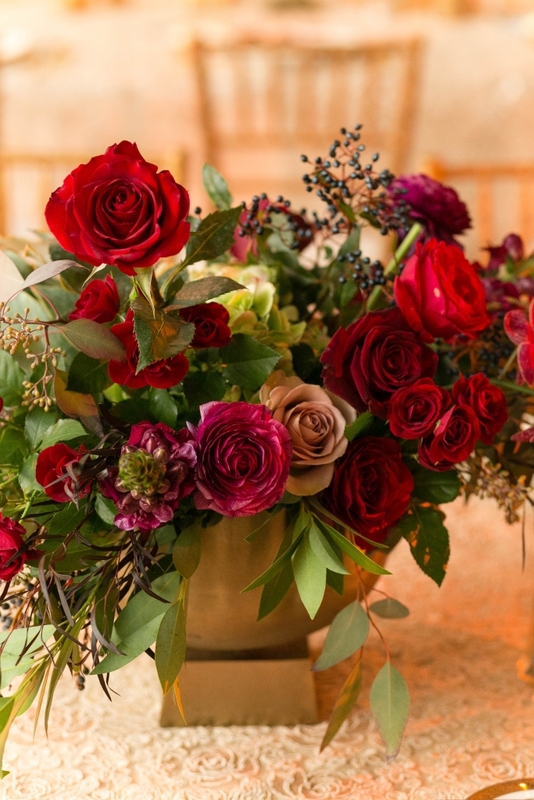 These stunning florals were donated following the celebration to hospital. 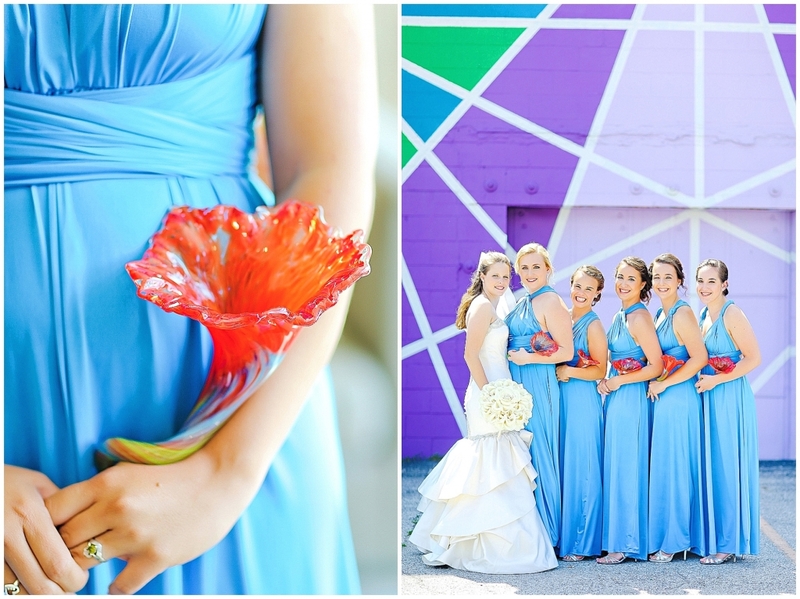 The bridesmaids were all tasked with finding their own dress for the wedding. 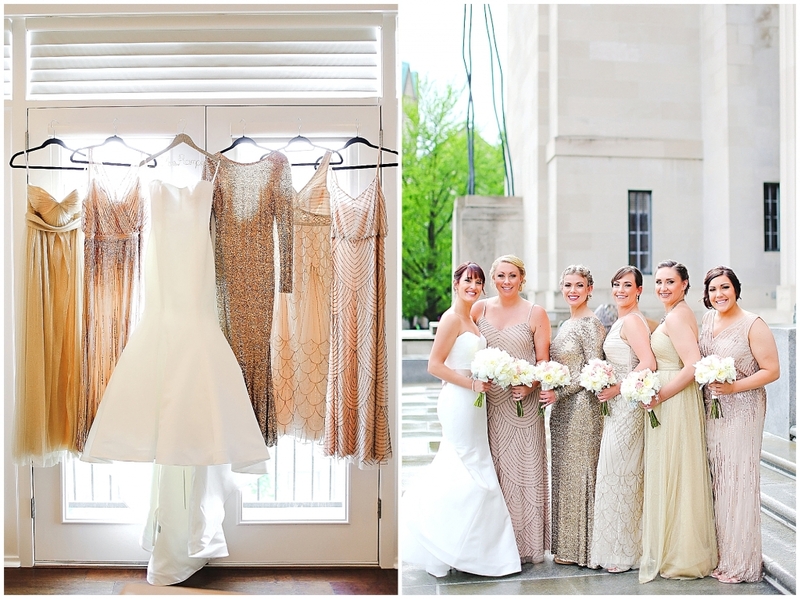 No glittery gold dress was off limits, which made for such a fun and beautiful outcome! 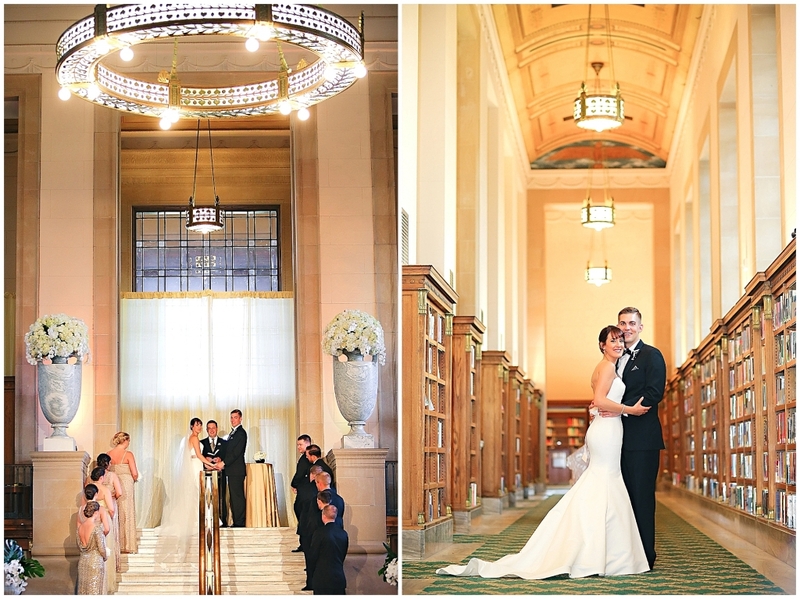 These golden goddesses looked timeless, elegant and spectacular in the ceremony space which was built in 1912. 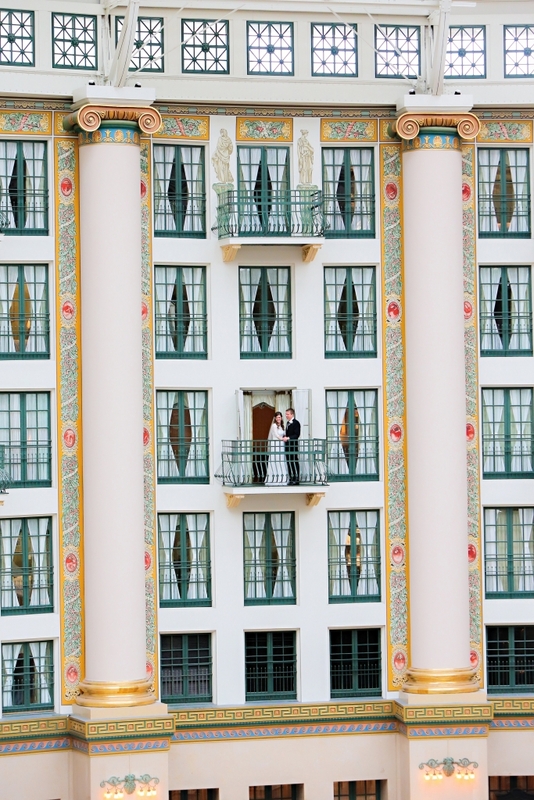 Since Christine and Ryan live in Arizona currently they wanted to incorporate it in to their special day but they were not sure how. After some brainstorming we decided that the best way to be able to bring in an Arizonian feel would be through the cuisine, more specifically the entrée. Working closely with the wonderful Ritz Charles they created a juicy chicken breast topped with a colorful fruit salsa and paired with a creamy spicy mashed potato side. 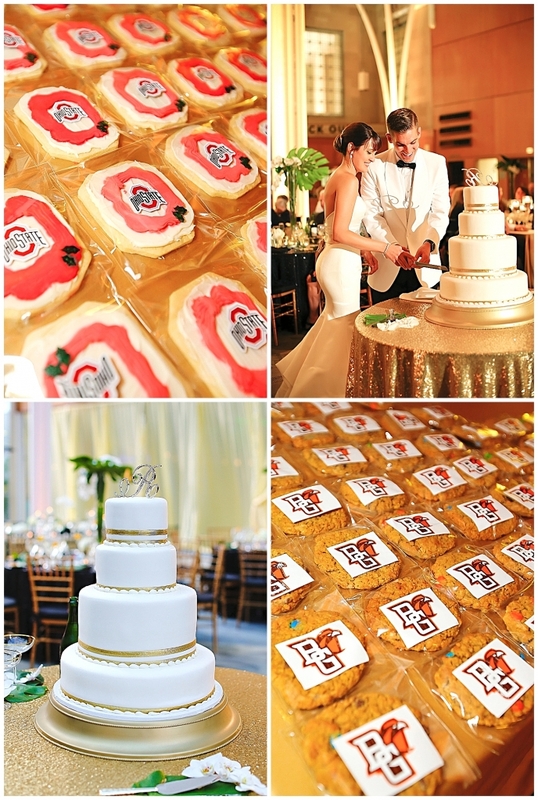 Another fun way to incorporate their personalities into the menu was a surprise “buckeye” flavored wedding cake. Decadent chocolate cake filled with peanut butter mousse. Christine and Ryan are a great couple but they do disagree on one thing – Who’s mother makes the better cookie? So what better way to end this fight then to have a so-called, cookie bake off! Each mother made their secret recipe cookie and decorated them with Christine and Ryan’s alma maters. We then handed guests one of each cookie to try as their favors. Christine’s mother, Terri, made sugar cookies iced with the Ohio State logo (ps… Christine is the 17th family member to attend The Ohio State, WOW!!!). Ryan’s mother, Norma, made her “Monster Cookies” packaged with a Bowling Green logo. I have a bit of experience in food competitions 😉 and I don’t dare say who won this battle – because everyone won, especially the guests who took home both yummy treats. BOTH were delicious! Each family can easily claim the win. I am beyond thankful that Christine and Ryan and both of their families allowed me to be a part of their love filled day. You are both so amazing and I know that you will both achieve greatness in every way. 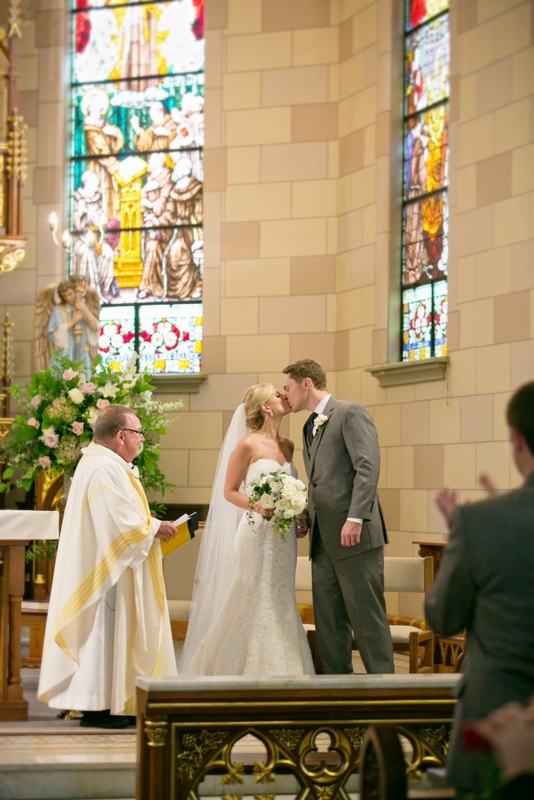 It was an honor to be part of your wedding, and more importantly, now part of your families. Thank you for allowing me to be included in your day. Terri, thank you for being the ray of sunshine the first time I met you and every single day since! 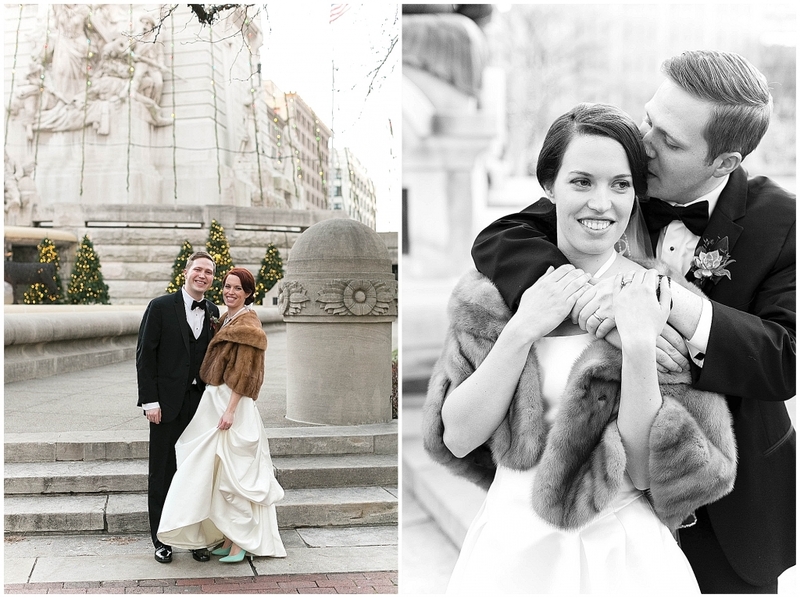 Oh I love a winter wedding! While the outside may be clear, crisp and cold, there is nothing like warming up to the warmth and intimacy of a wonderful candlelit wedding celebration! 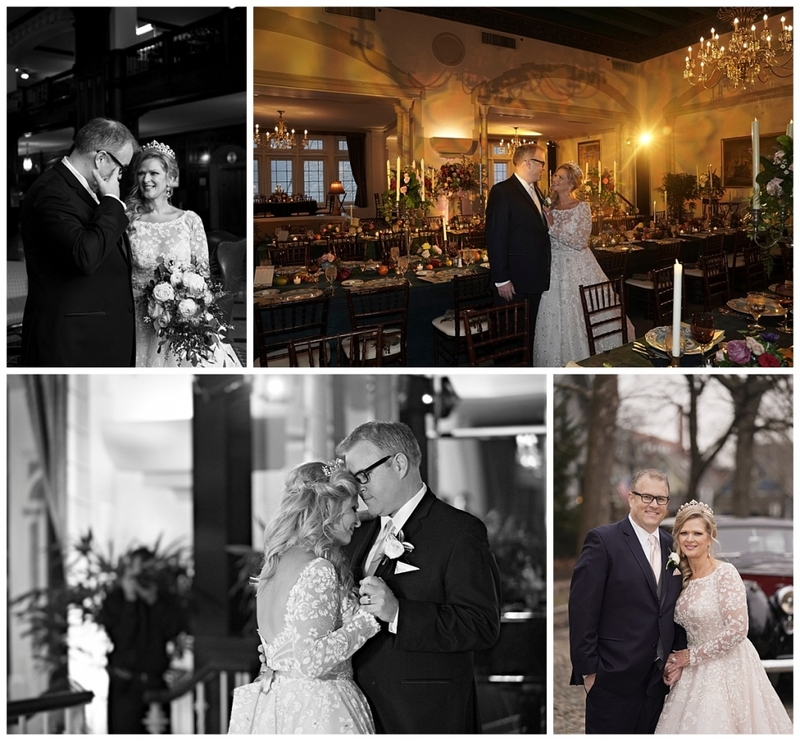 Maggie and Andrew had exactly that idea in mind for their wedding when they came me for their January wedding and I was so excited to help them plan their big day! Maggie and Andrew actually met (literally) on their way to Italy on a trip, so their first date was overseas. 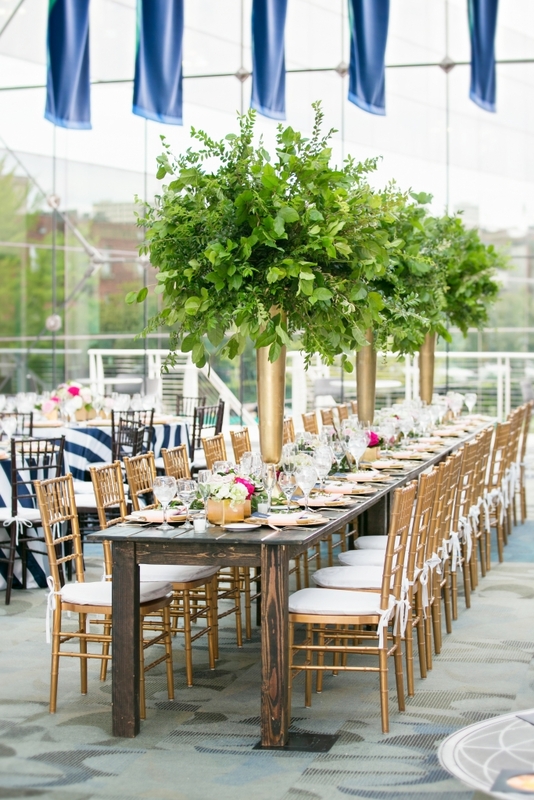 Because of this, they wanted their reception to have a wonderfully warm, family atmosphere – much like the relaxing dinner on a vacation would be. 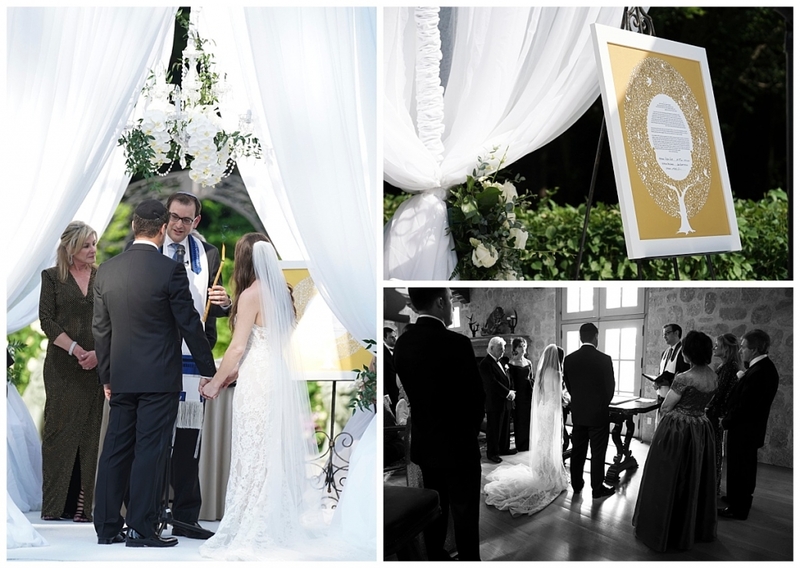 They also said they wanted their guests to say “the night completely suited their personalities.” Maggie and Andrew certainly started that tone by creating their own personal family crest for the wedding invitation suite. This crest was then infused throughout the night on various paperie including the wedding program, menu card and signage at the reception. 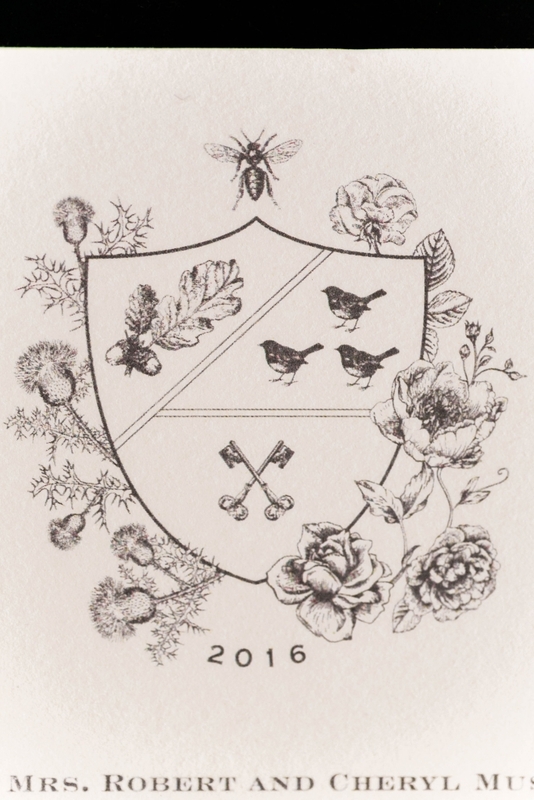 The menu card even included a key explaining the history of their crest and how each component of the crest was chosen to create the unique piece for the new family. 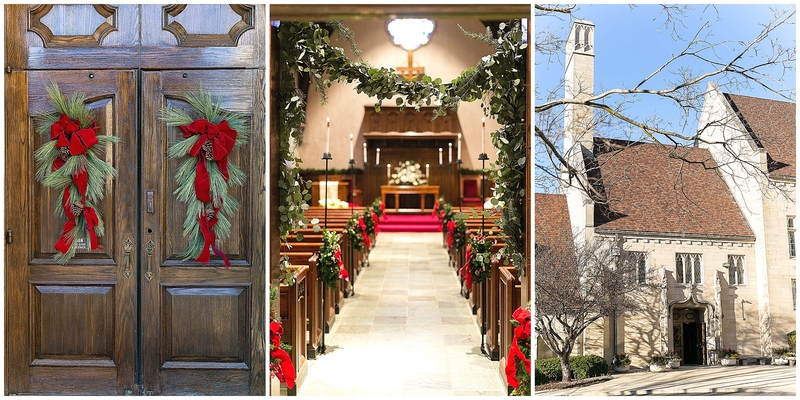 The service was held in a chapel adorned with winter foliage perfect for the holiday season! 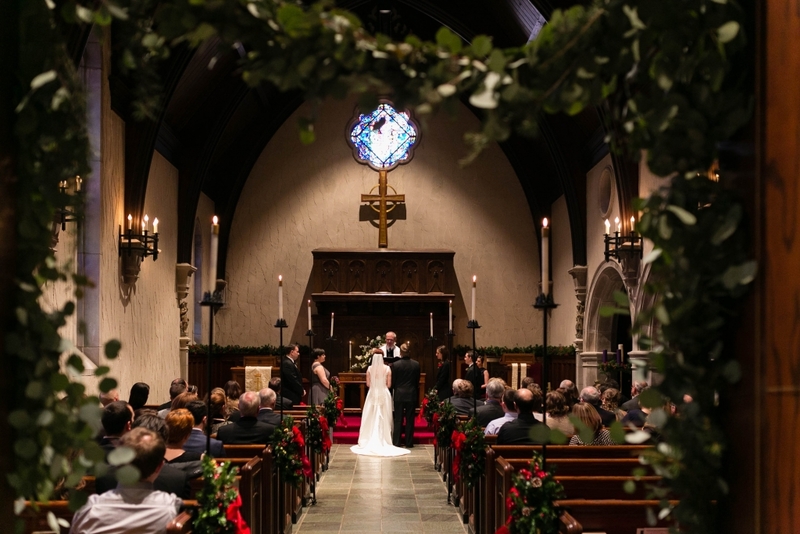 The church had an English countryside feeling to it because of the greenery arch created and the organic nature of its draping. This created a since of warmth and coziness on the crisp winter evening. 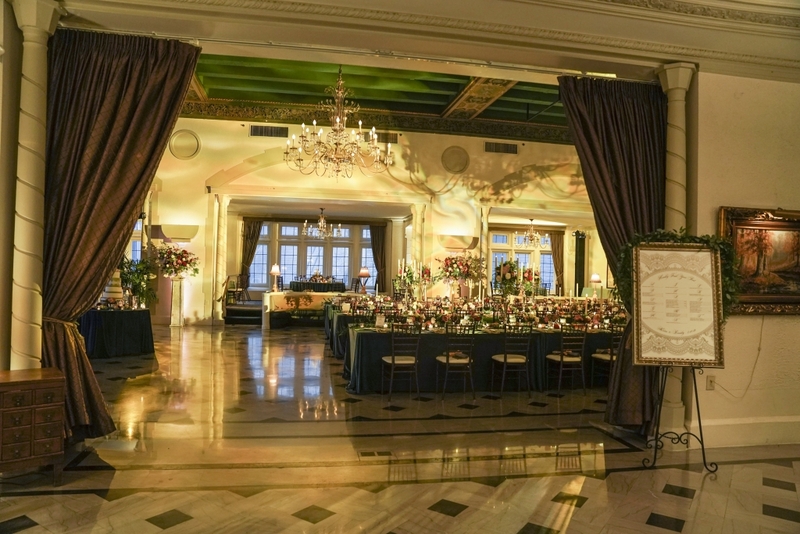 Following the ceremony the guests went to the Columbia Club for the reception. 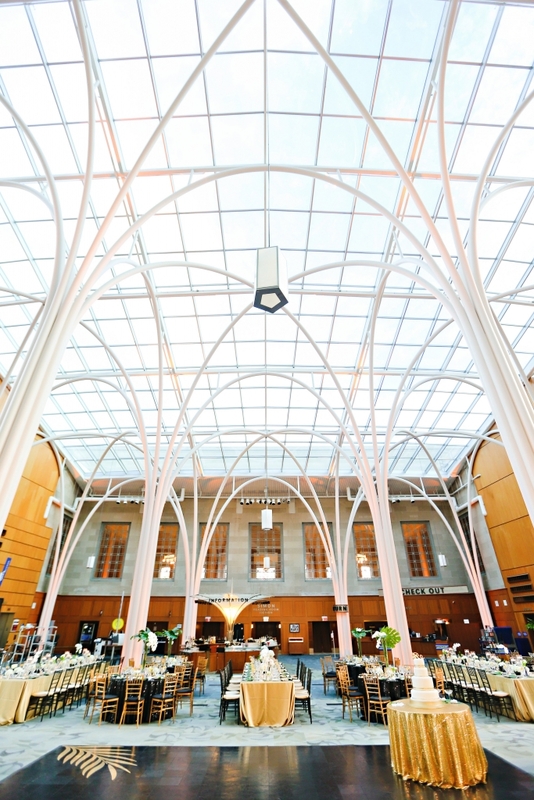 Here they indulged in the old world opulence of one of Indianapolis’ most historic buildings. The city still had the Circle Of Lights still up so guests could enjoy the spirit of the season for one final weekend. 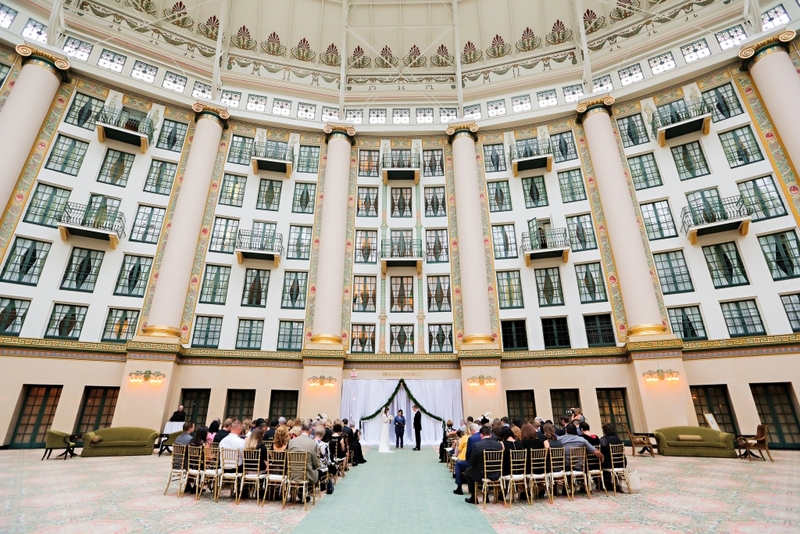 Maggie and Andrew took advantage of this, and enjoyed a few minutes on the Circle before retreating to the reception with their guests. 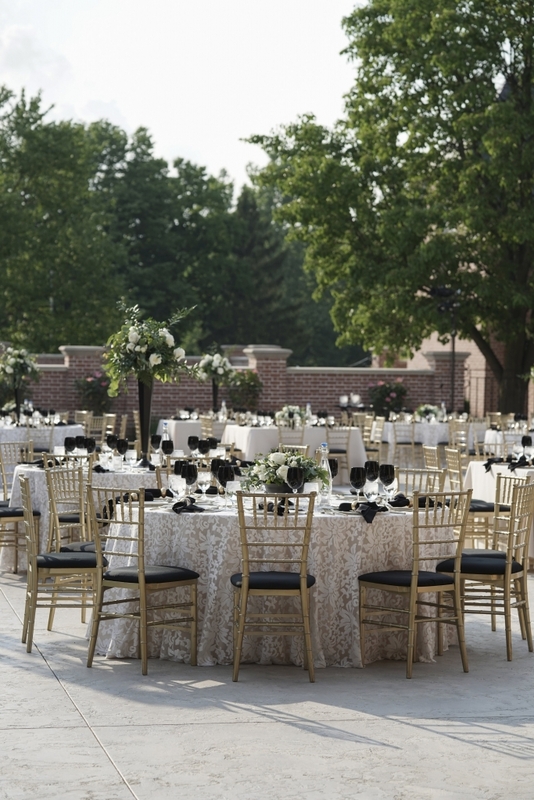 The reception tables glistened like the Christmas tree outside on the Circle as hundreds of candles sparkled of the lace and sequined table linens. 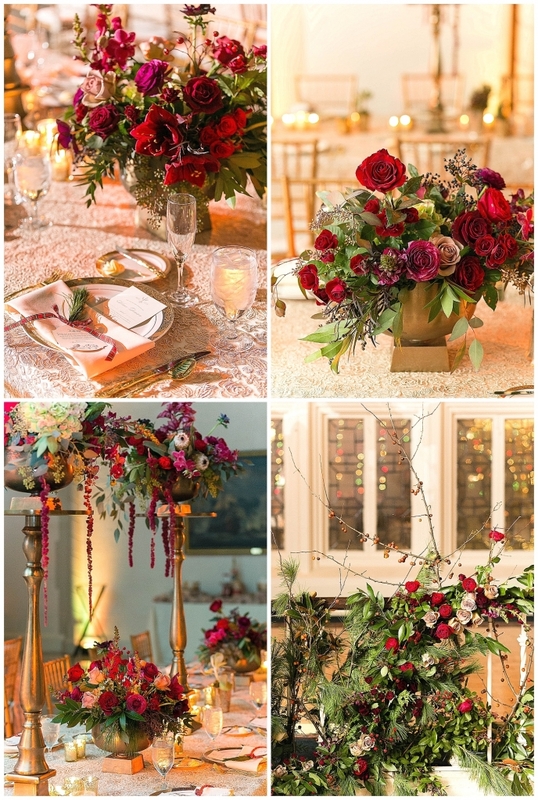 Vibrant floral in hues of crimson, scarlet and blush were scattered along the tables added another layer of rich holiday color. Along with the wonderful red flowers, succulents, grown by Maggie’s father (himself a Master Gardner) were in small vases in abundance throughout the reception. Thistle was also dotted in many of the bouquets to add a touch of Scotland to the day — a way to honor Andrew’s family heritage. His family’s tartan ribbon was also used to tie the favors throughout the weekend. It was a night filled with family, old traditions, new traditions and new beginnings for a new year. 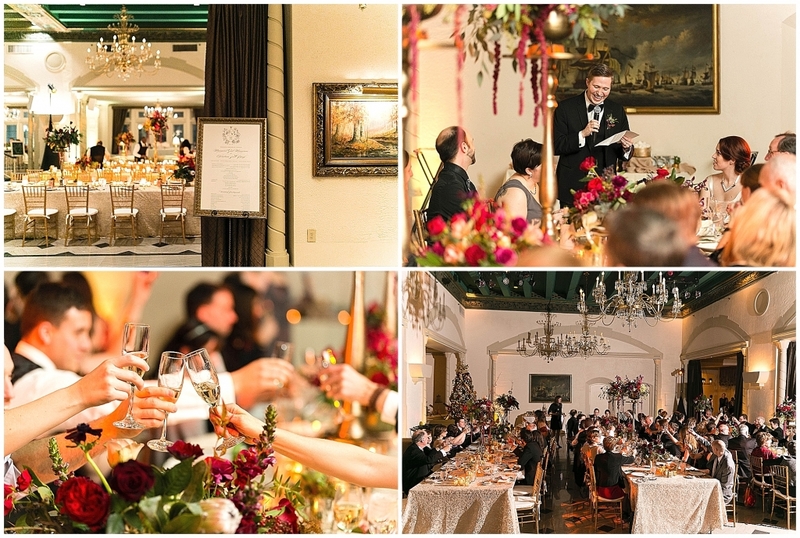 It was a cozy and intimate — even on a very crisp winter evening. 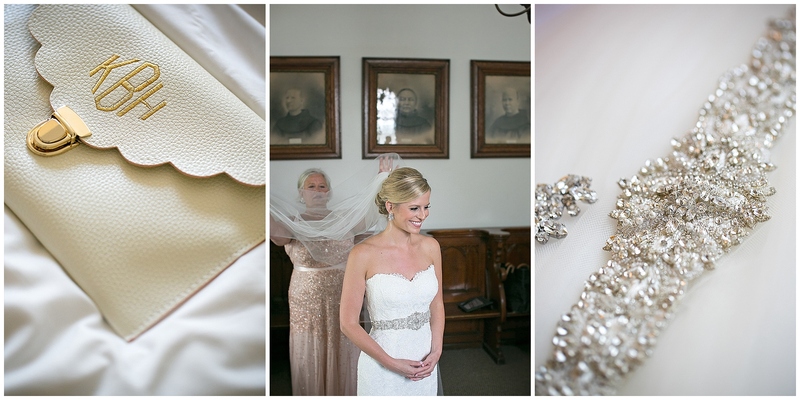 And that’s what makes winter weddings magical, they’re so full of warmth and love. 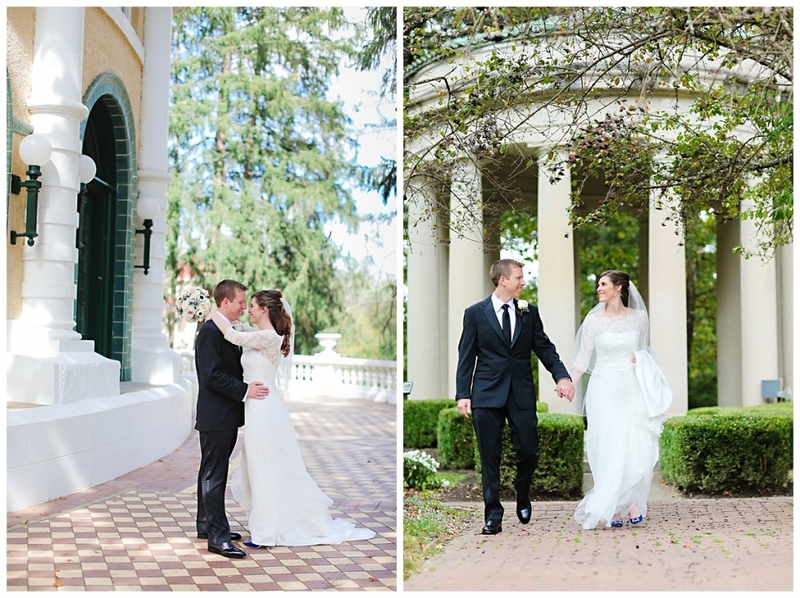 It was such an honor helping Maggie and Andrew create their day. These two have their heads on straight. 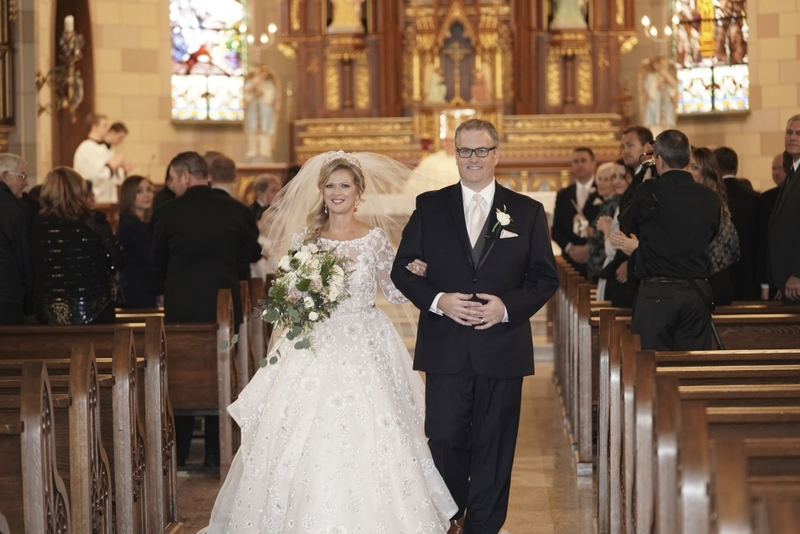 I really adore them, and I love that they started their new life in the new year as husband and wife. Best wishes always! 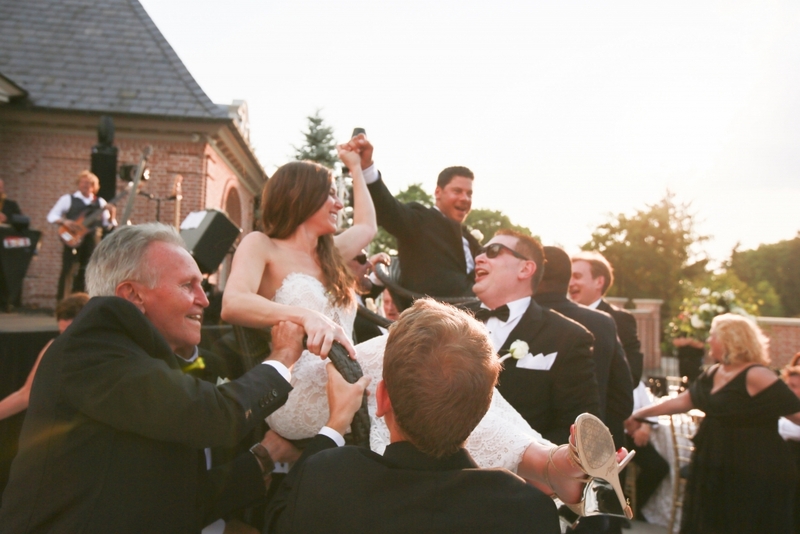 The wedding of Kate and Brad was stylish, uptown and chic — just like the couple themselves. 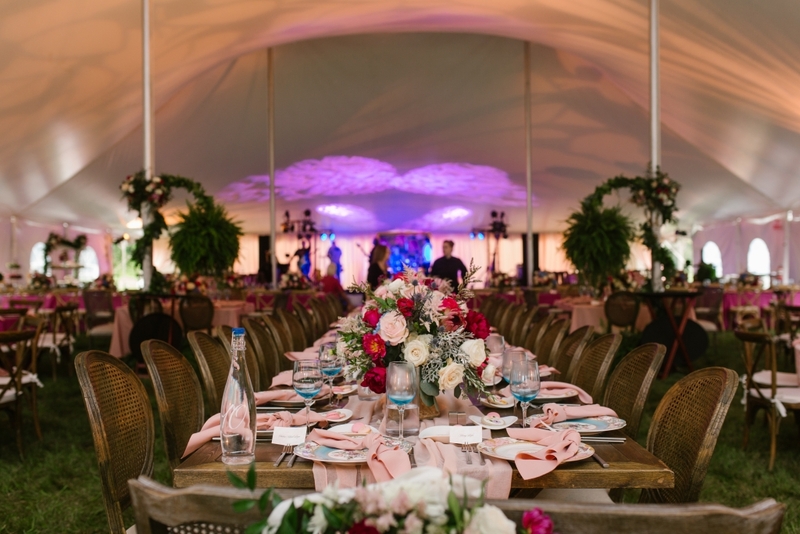 Somehow this wedding – bursting at nearly 400 guests felt like a small dinner party because Kate and Brad took the time to ensure each intimate detail was carefully crafted and cultivated. 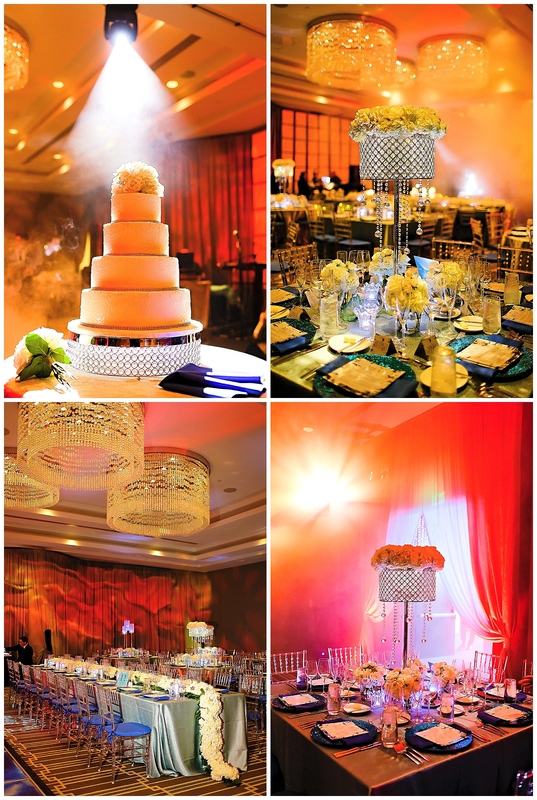 It was an honor to help them create this splendid occasion!! 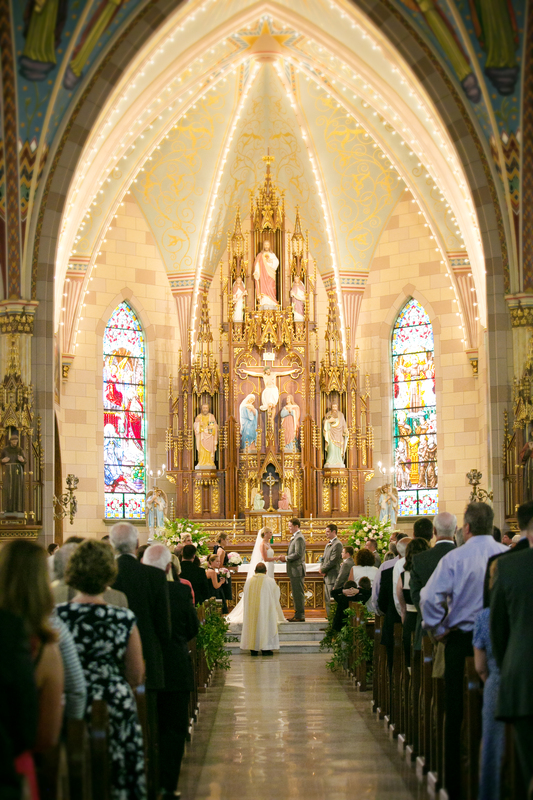 Kate and Brad were married and the breathtaking Sacred Heart Catholic Church just south of downtown Indy. The architecture of this church lends itself to fairy-tale weddings and idyllic photographs. Kate and Brad with their nearly dozen flower girl carrying lanterns and ring bearers parading down the aisle didn’t disappoint. The ceremony was presided over by the priest from Brad’s school, and included both moms helping to prepare the altar by unfolding the prayer cloth. I loved this personal touch before the moms lit the unity candle. Lush greens decorated the aisle and altar and gave guests a hint to the garden cocktail hour and reception that was in store for them the remainder of the evening. 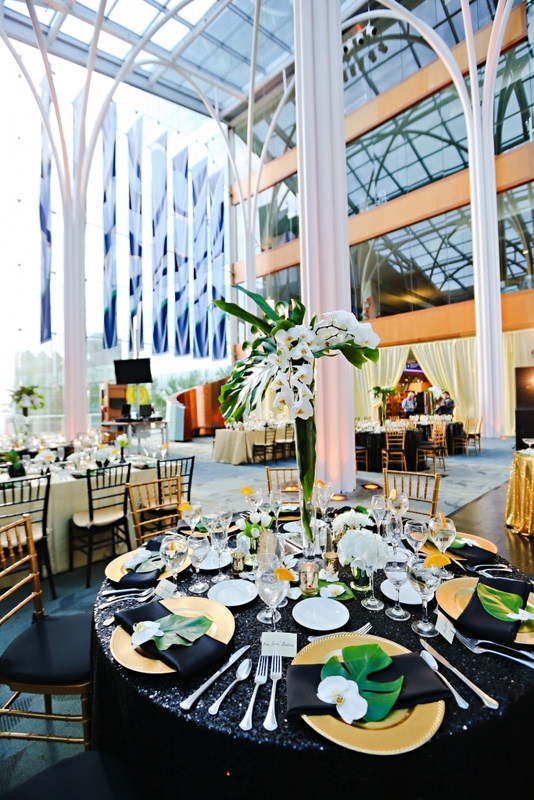 The reception, hosted at the Central Library, began in the library’s garden. 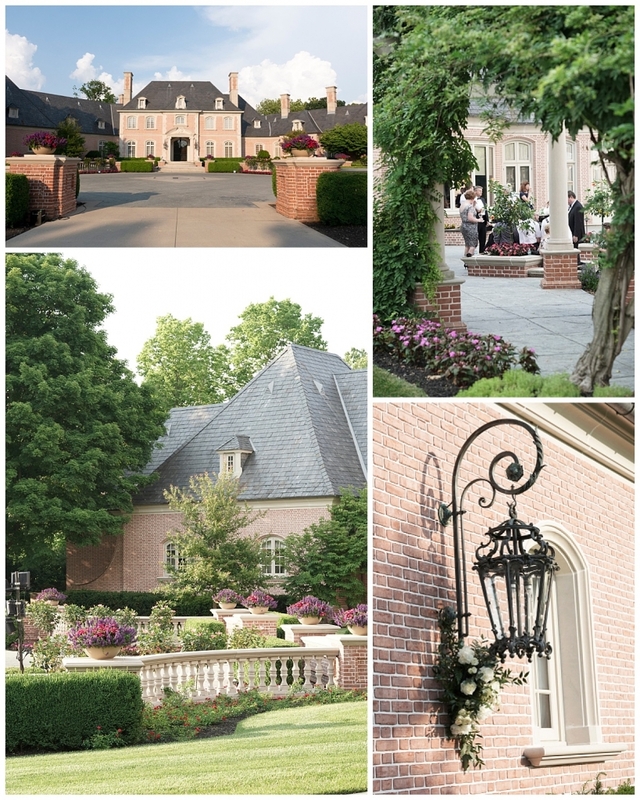 Here the guests reveled in the perfect weather and enjoyed cocktails and hors d’oevures outside. 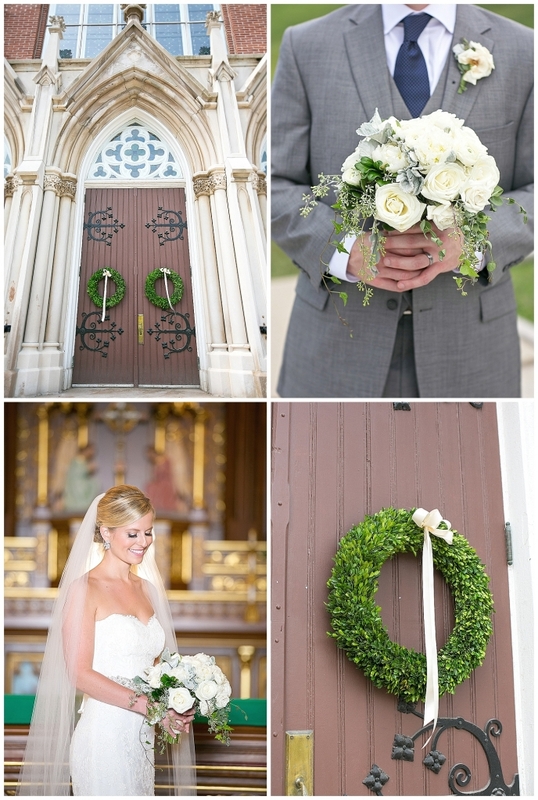 Kate’s mom surprised the newlyweds with bagpipers to ensure Irish eyes would always be smilin’. 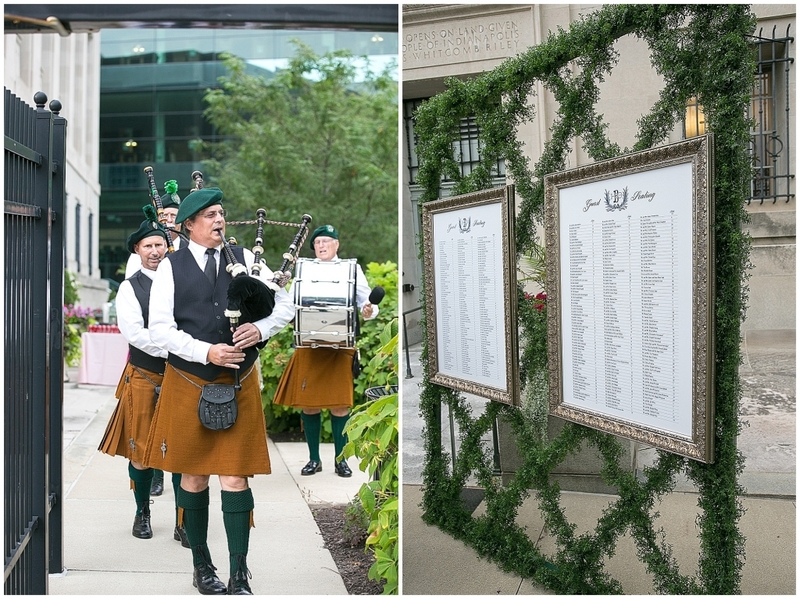 Guests then followed the pipers and proceeded through boxwood lattice gates to the reception celebration for the remainder of the evening. 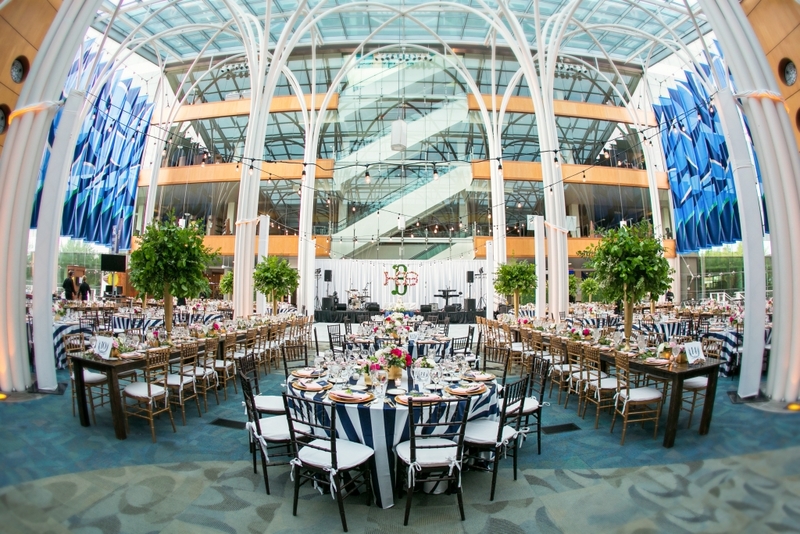 The celebration decor was upscale and uptown. 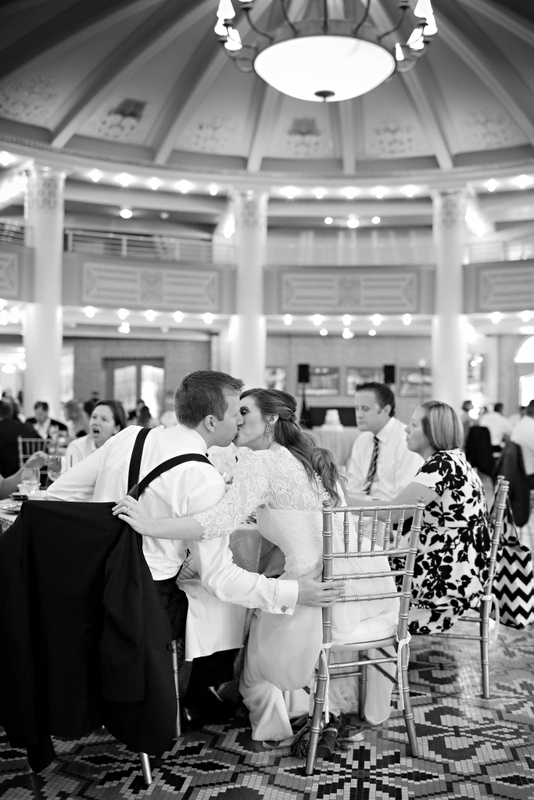 Kate loved stripes and thrilled to share them with her guests in fun and unexpected ways. Though the whimsy of the stripes was fun and playful, Kate could not have been more chic, elegant and timeless. 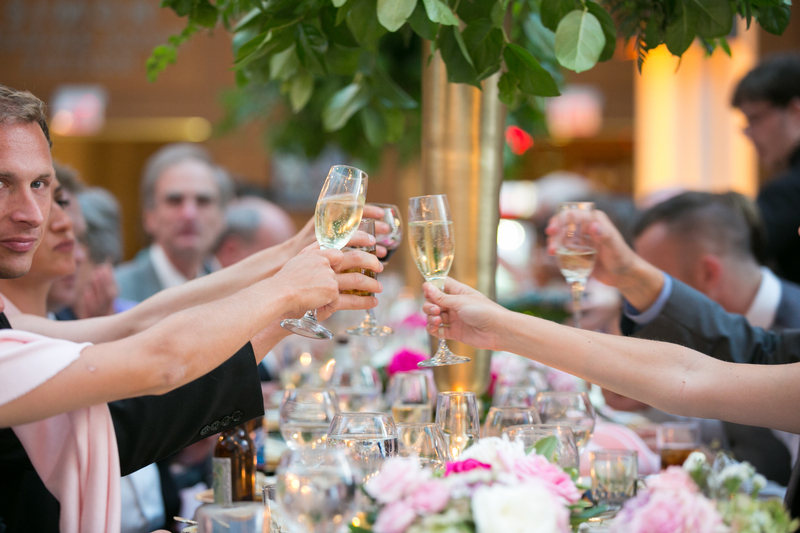 The reception truly gave guests a bit of both. Kate wanted to have a beautiful English Garden with lush sophistication, and yet the modern fun of a cosmopolitan evening. 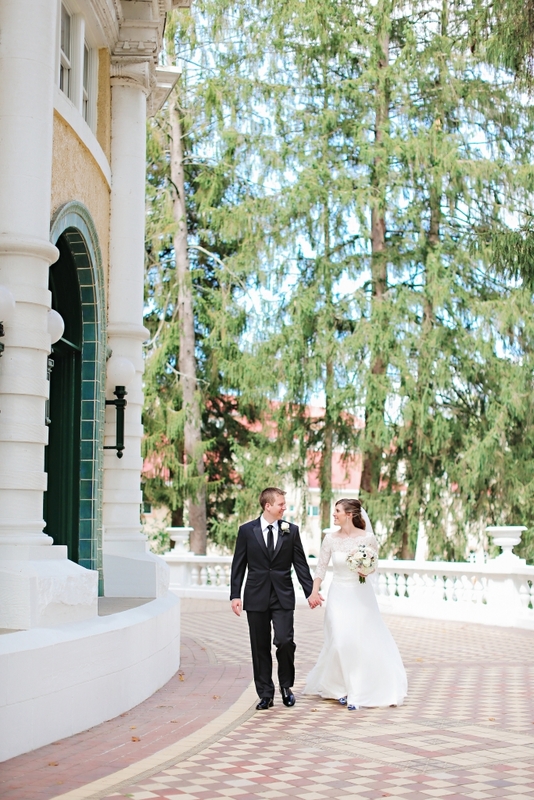 Kate and Brad accomplished this with a truly edited design. 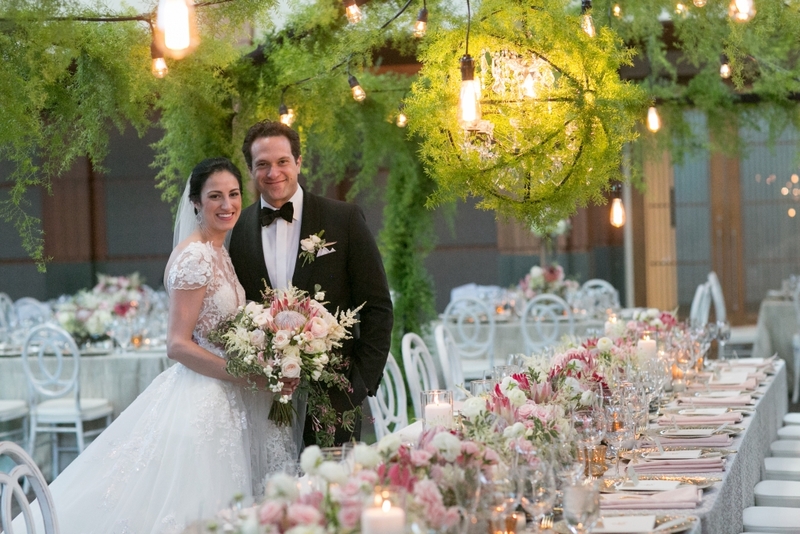 By incorporating lush foliage and romantic floral, the couple allowed guests to feel as though they were dining in a garden under the stars. 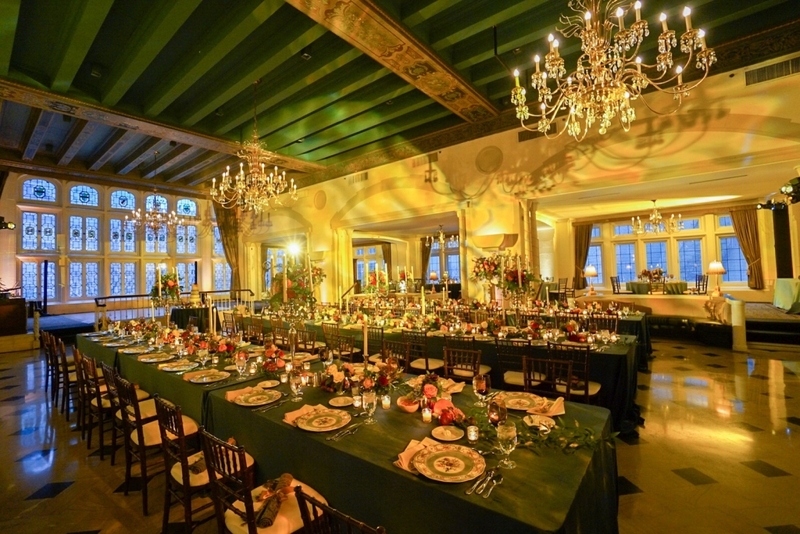 This was accomplished through the use of lighting by having the guests dine under specialty Edison lights which gave a special al fresco ambiance to the indoor space. 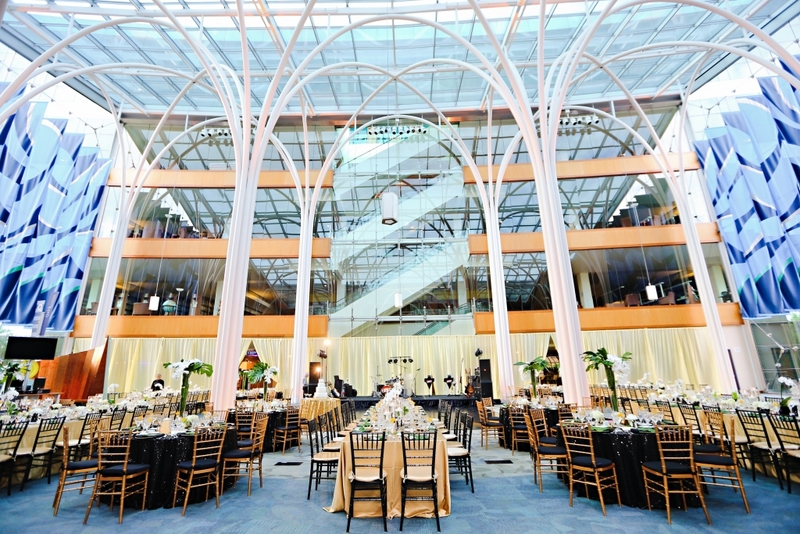 The focal point of the atrium was a floral monogram created with boxwood and roses custom created for the family. 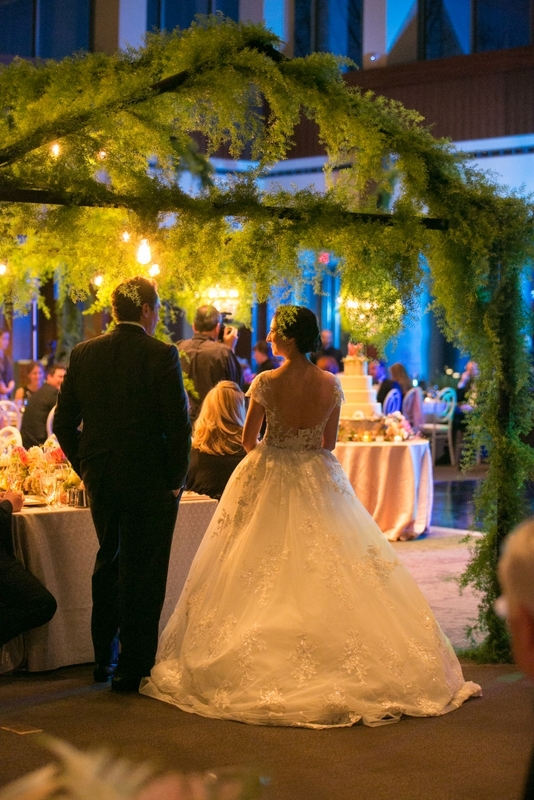 The guests adored they “English Garden” warmth of the wedding as they entered the ballroom. It as lush, welcoming and intimate. It was exactly as Kate, Brad and their families has hoped it would be! It was a night full of great joy, laughter, family and so much love! 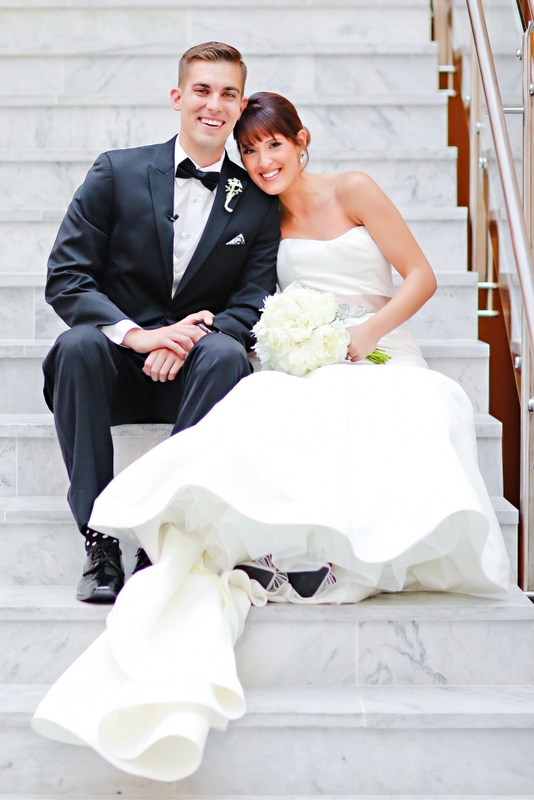 I am so honored I could help this amazing family create this weekend for their guests. 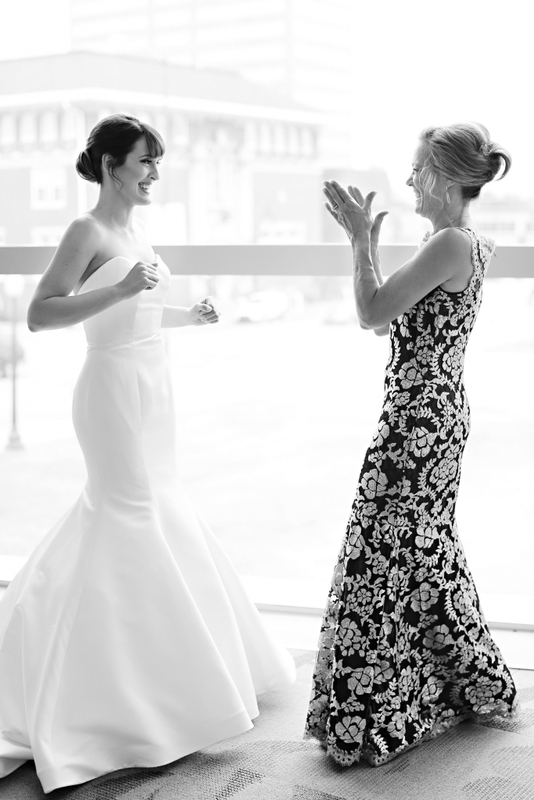 Kate’s radiant and graceful smile NEVER left the entire process. 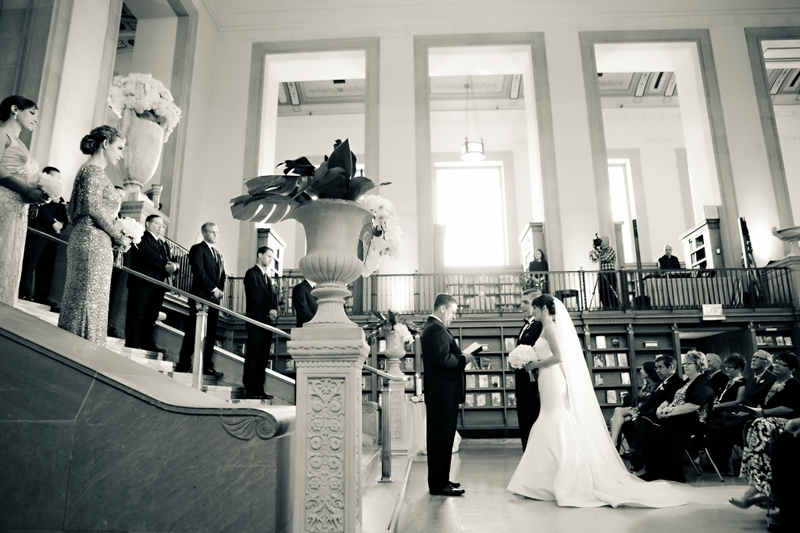 Thank you for allowing me to be part of your wedding. Cheers! 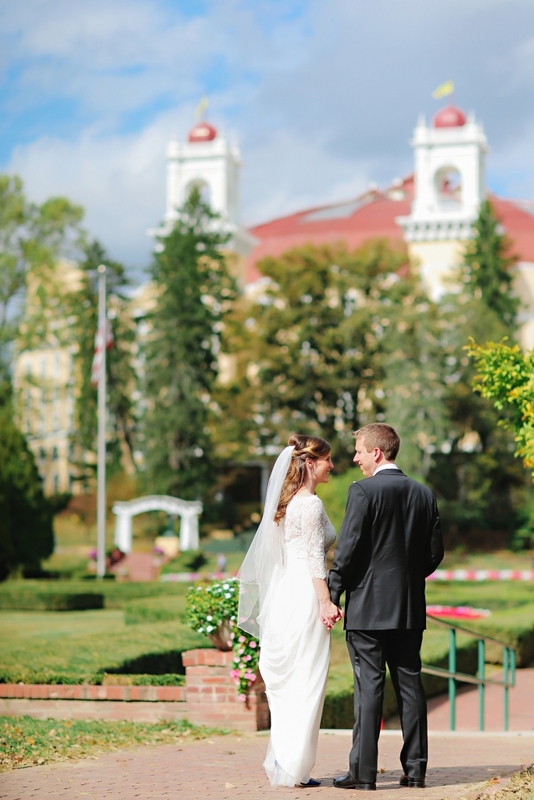 Fittingly, on Valentine’s Day 2013, we toured several locations and Brittney and Conor selected the hotel I thought would meet all of their needs for the wedding ceremony and reception, the Alexander. 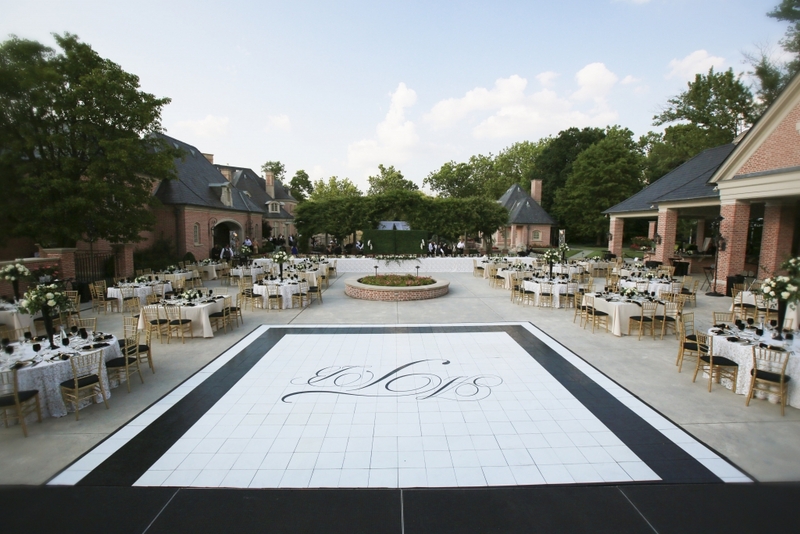 I knew here I could create exactly the design and entertainment portions of the night that would leave a lasting impression on their guests. 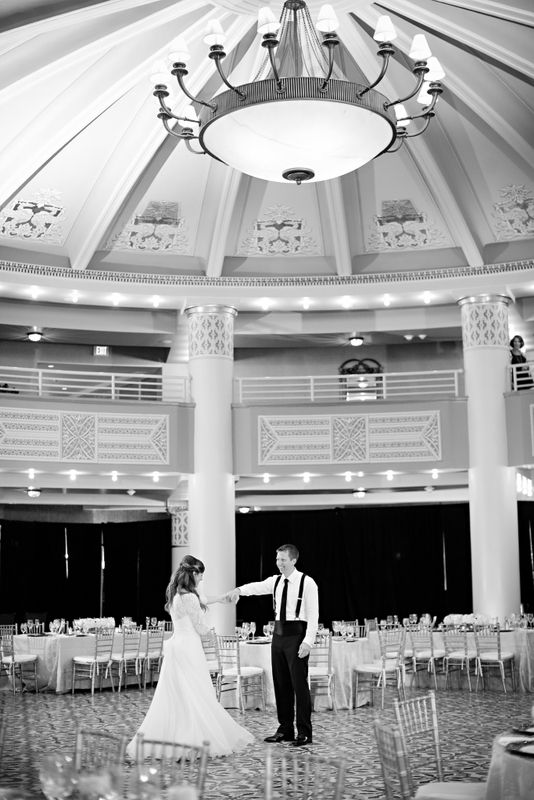 The Alexander has several blown glass chandeliers and I liked the idea of including the glass throughout the event. Brittney did too. The ceremony was the Fire portion of the event. 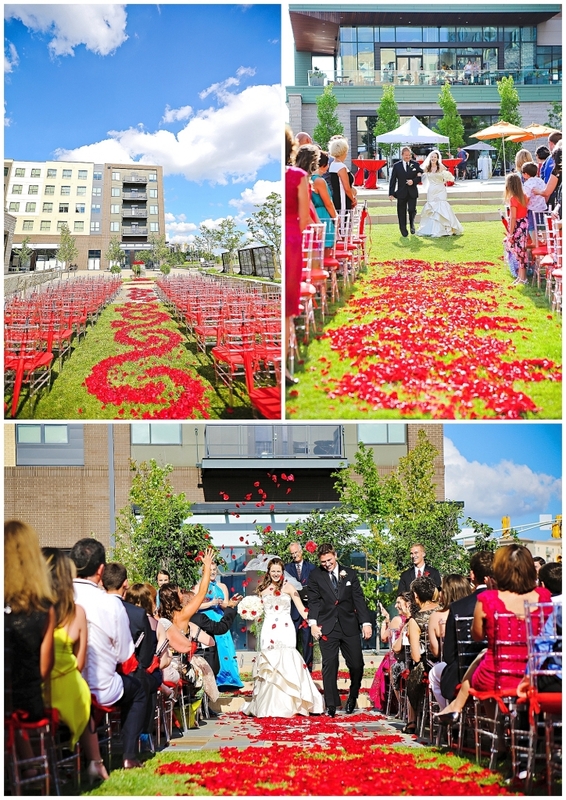 Red dominated the wedding ceremony, which we hosted outside in the courtyard. For entertainment a glass blower was present during the cocktail hour before and after the service. 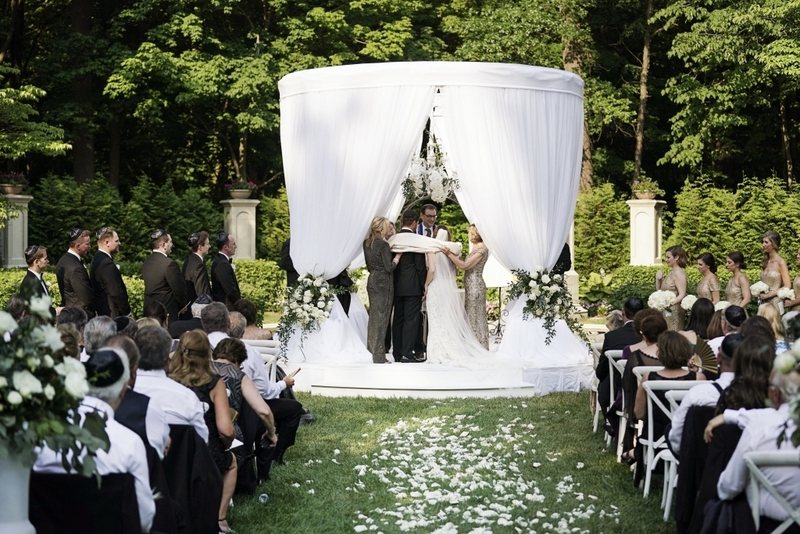 During the ceremony, a glass ceremony replaced a “sand ceremony” as small particles of glass were poured together which the artist then created into one large sculpture for Brittney and Conor. 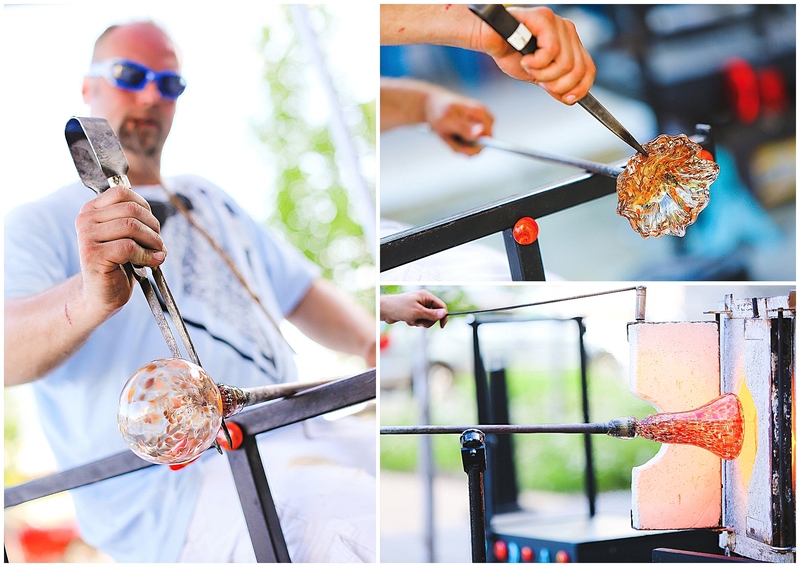 He also created custom glass pieces for the bridal party to carry as their bouquets. 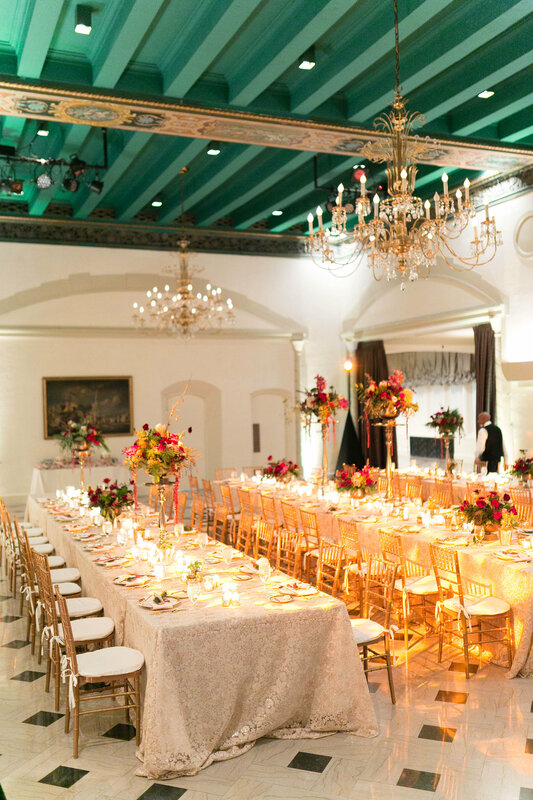 As guests first entered the ballroom for the reception, it was all lit in red and had a “fire” wall, but once guests were seated, they were cooled down for the Ice portion of the evening. Cool air and blasts of coolant filled the space as the bridal party entered the room! 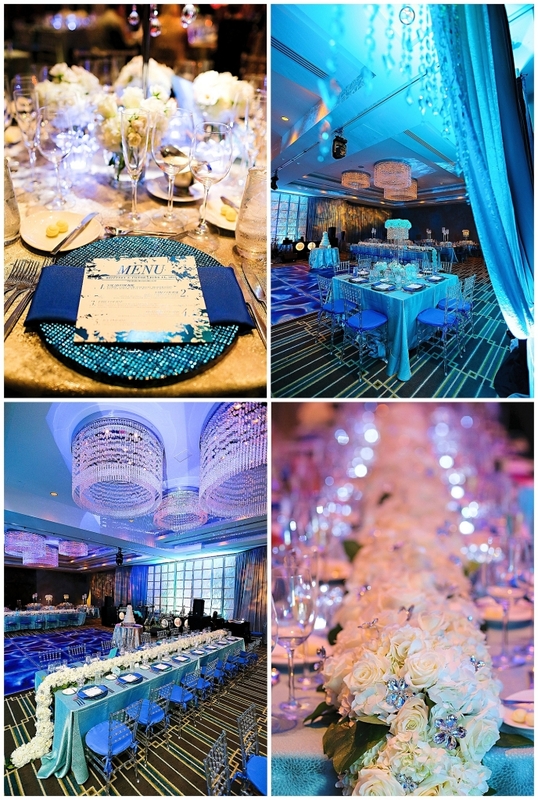 The reception decor was created in tones of turquoise using muli-tonal lighting effects, clear chairs, silver and blue linens and again the use of glass. 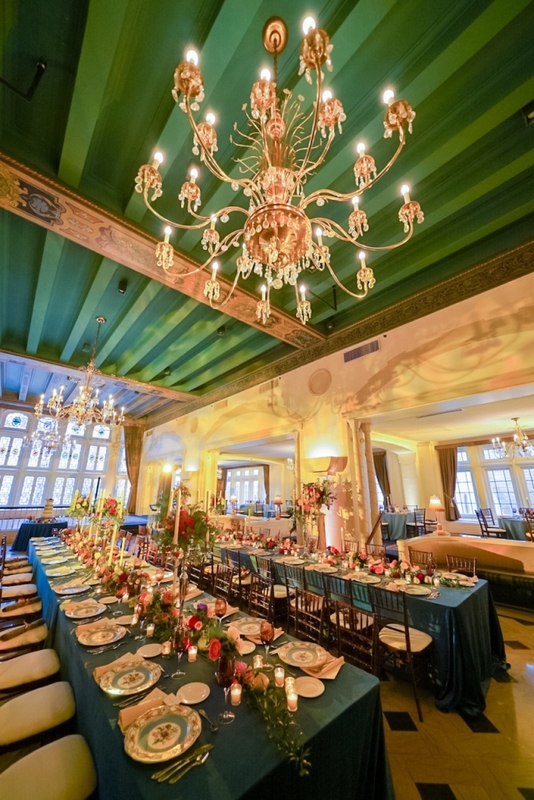 Turquoise glass chargers and custom glass sculptures enhanced the tablescapes. 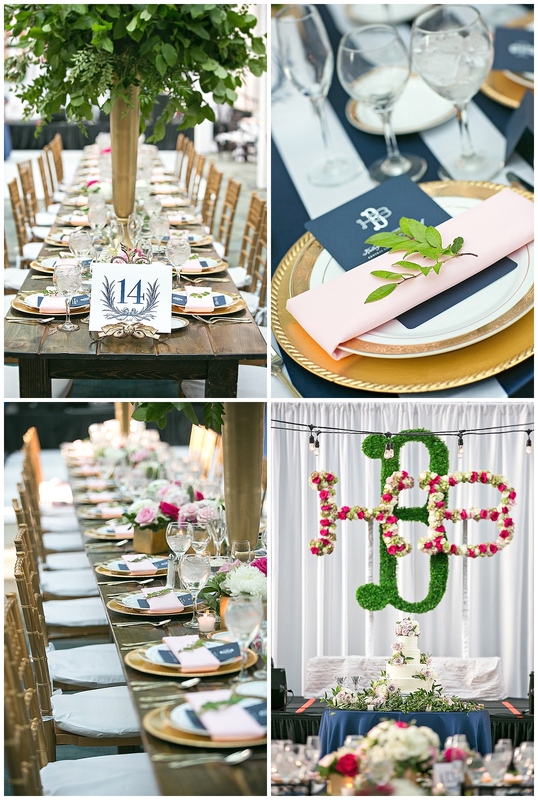 The table numbers mimicked the invitation which were both clear acrylic. 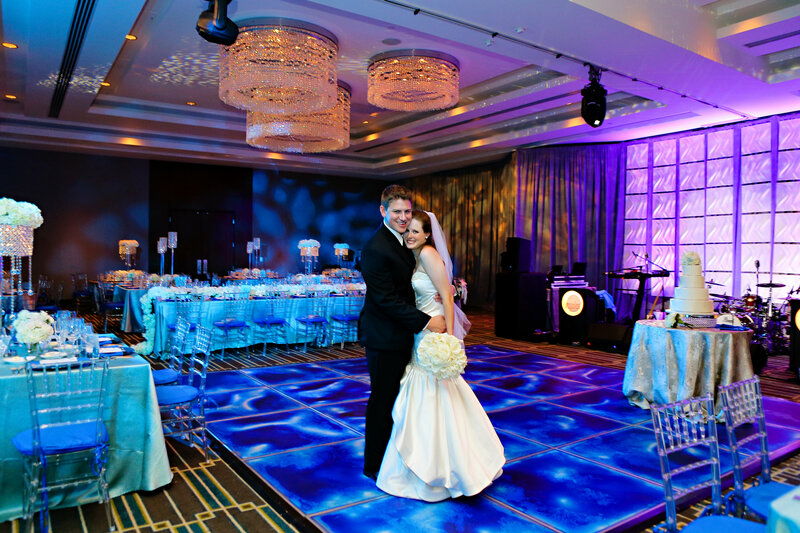 The final touch was the liquid dance floor which looked like cracked ice and looked exactly like the invitation suite and all of the paperie created for the wedding weekend. 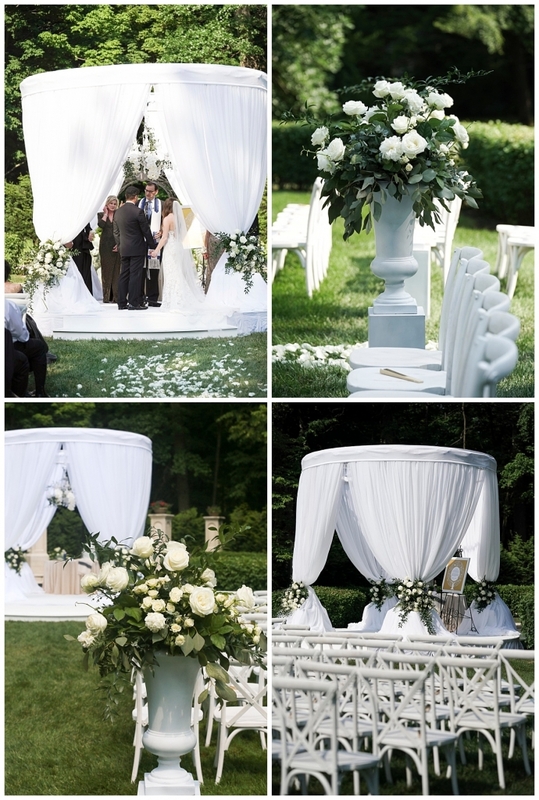 White flowers dotted with crystals and centerpieces of crystal chandeliers completed the celebration. 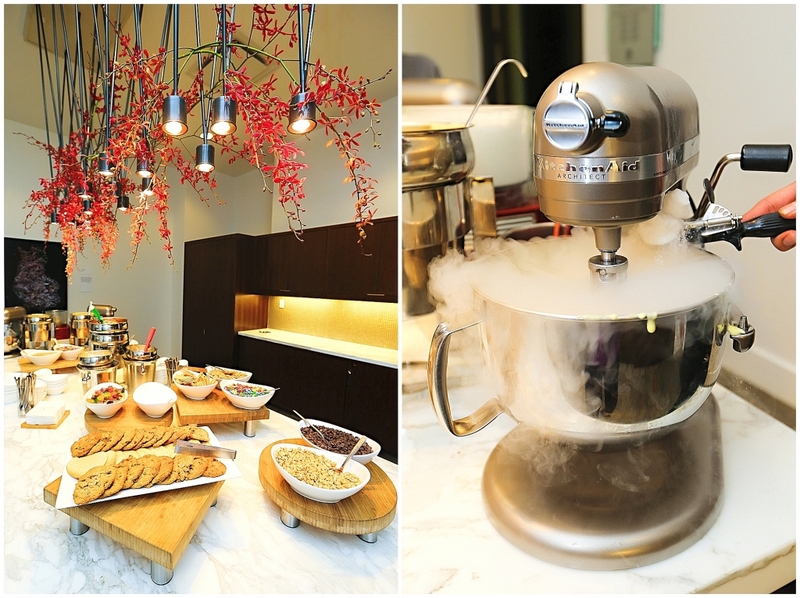 Even the menu selections reflected both fire and ice whether it be the chilled iceberg salad, the fire roasted entree courses (both a fish course and beef course were served) or the cryogenic ice cream sundae station during dancing to cool guests down helped continue the theme. 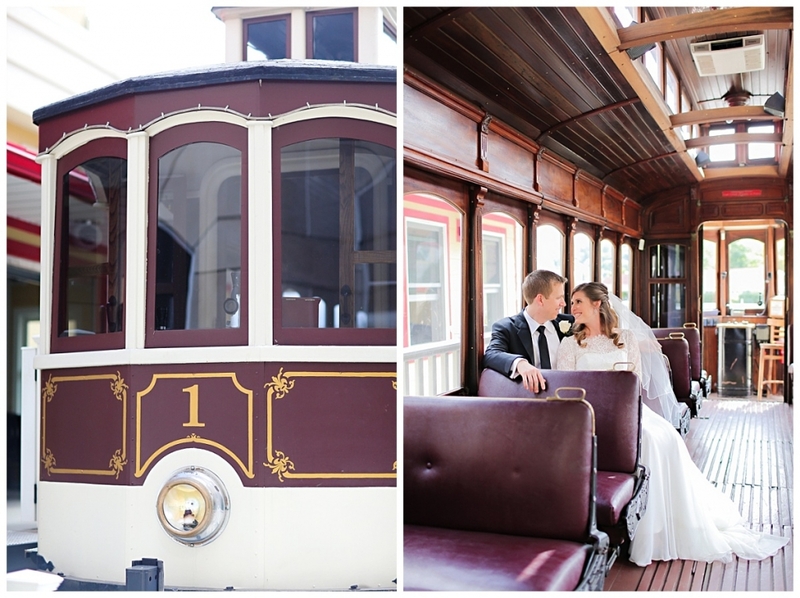 Brittney and Conor’s wedding was a delight to create in part because they were so willing to push the envelope and in part because they were so.much.fun! 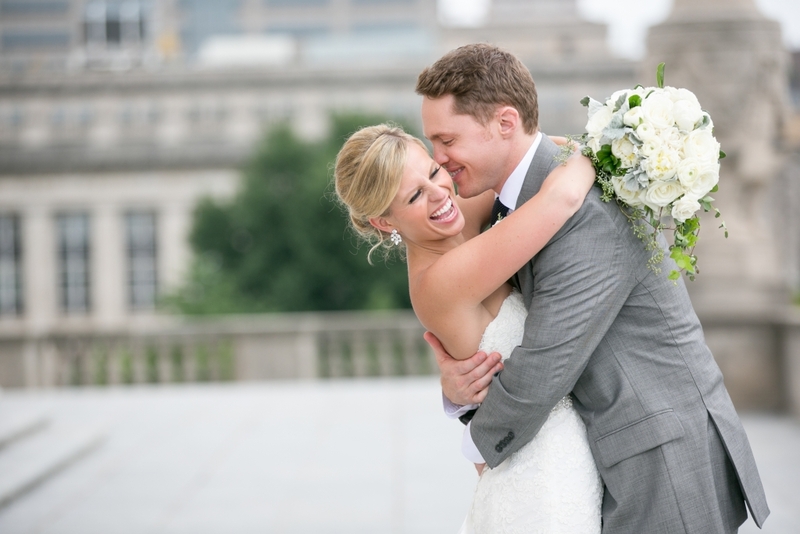 They were always smiling – ALWAYS – and they truly relished in the entire process. Every step of the way they trusted the professional team and just showed how truly excited they were for the wedding night to come. It showed. 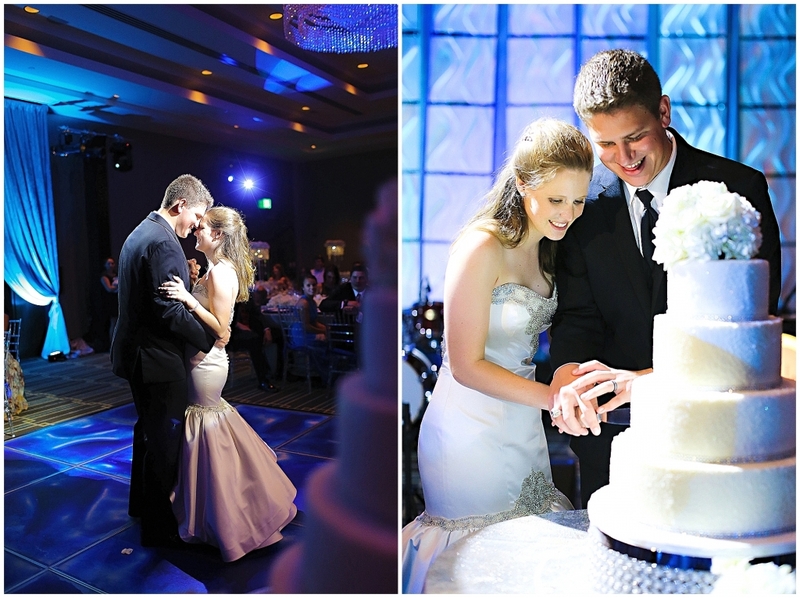 They are an amazing couple and I’m truly honored I could help them create their celebration! 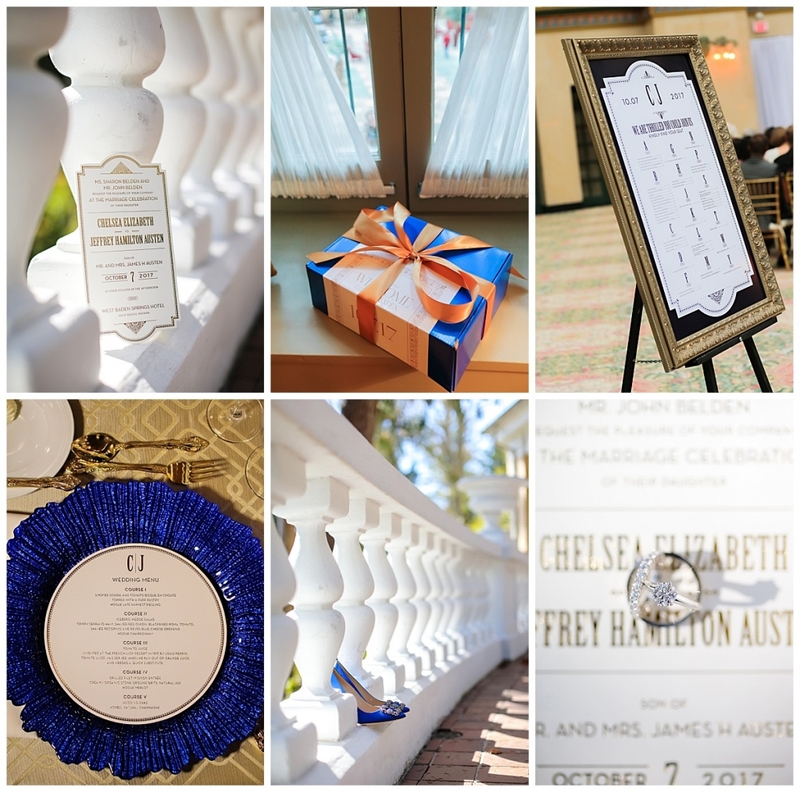 As I would prepare for a wedding, the final details would be checked off and naturally the personal touches that make a wedding beautiful, unique and special would be picked up by me. 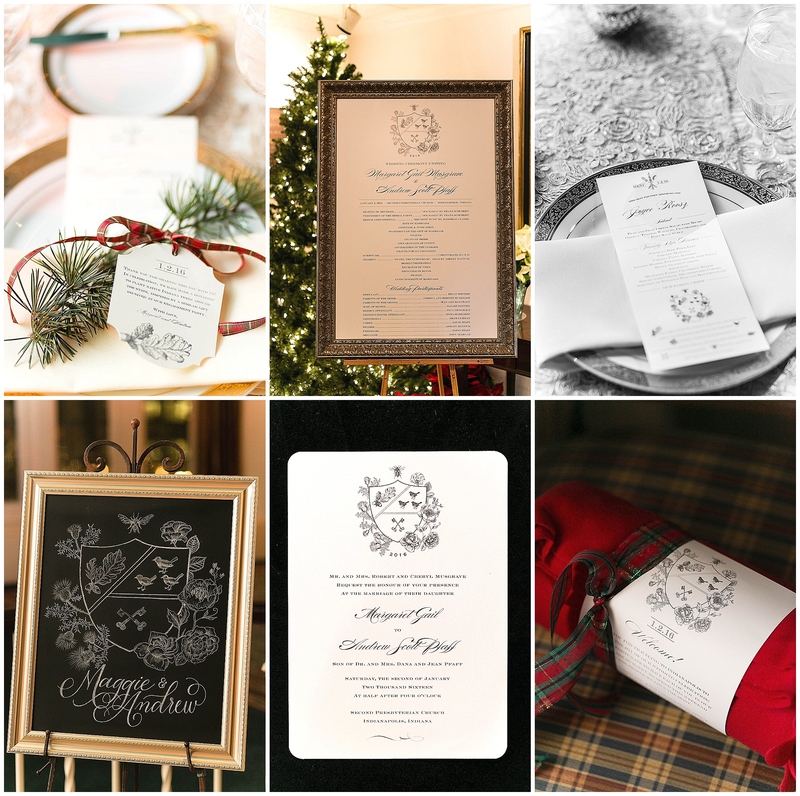 These might include favors, place cards, table numbers and of course menu cards. 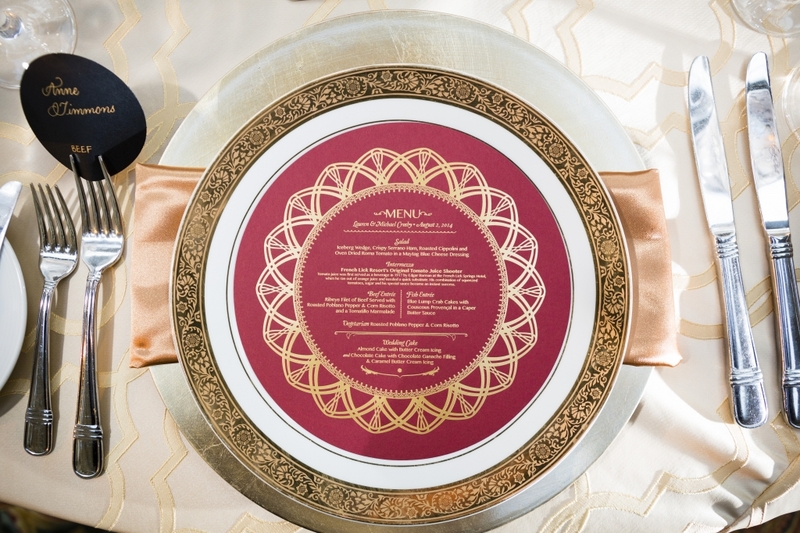 After the wedding I would keep a sample menu card for my records. From time-to-time if there was an extra during clean up I would give a couple to Sabrina so she could “set the table” at home and make it pretty for Sunday dinner. This began at a very very early age. Food Network was always on in our home. It was the white noise in our house. I wanted to know great menu ideas or the latest trends in the culinary world. Clearly both of these stirred up something in Sabrina. Little by little I noticed Sabrina started asking about menu items as she would read the cards. 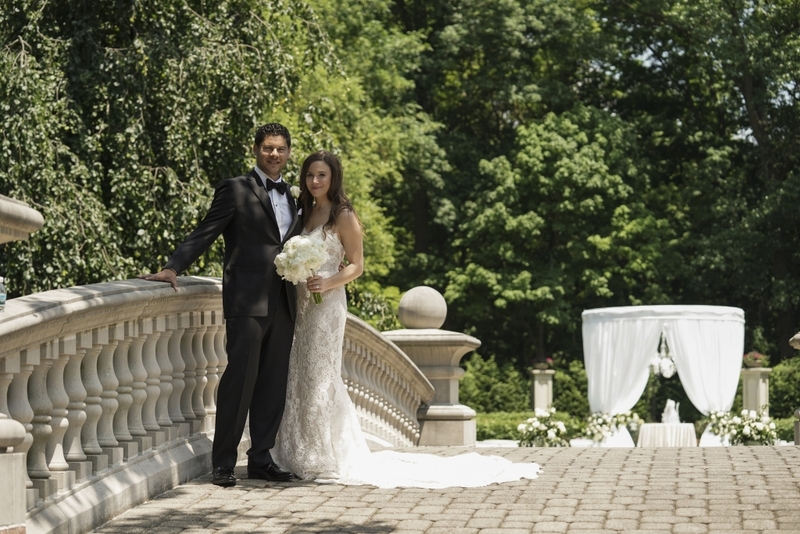 “How do I make beurre blanc sauce?” “Can I try osso busso sometime?” “Tell me about sou vide.” She wanted to know where a menu item originated from, why the couple picked it, who was catering the wedding, and the preparation process. I also noticed her recipe book was getting fatter and fatter. She was keeping each of the menu cards (from years and years of weddings!) I asked her why once and Sabrina replied, because now I’m a good enough cook to make most of these and if I’m not, I know I’ll get there. It was impressive to me to see what was little “gift” from a Saturday night to make Sunday’s dinner table prettier, was now something serving as part of her culinary inspiration! 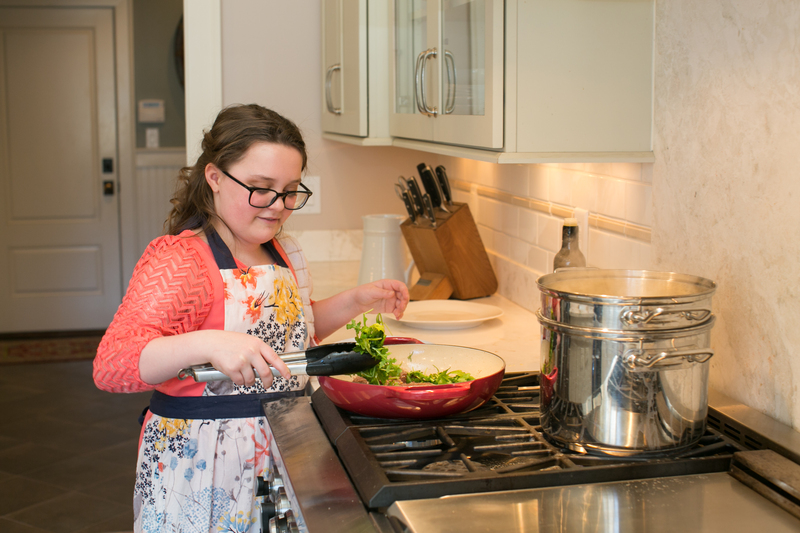 I have no doubt Julia Child changed Sabrina’s life. 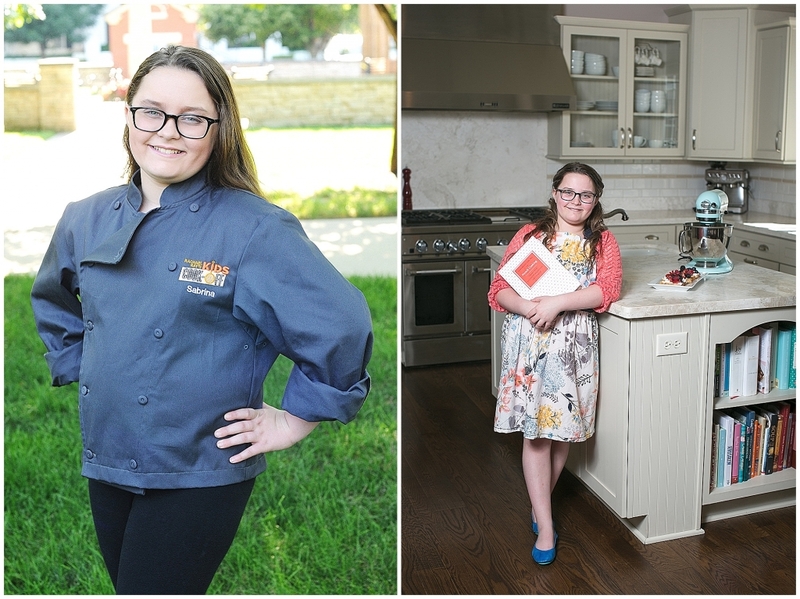 (anyone who’s watched Rachael Ray’s Kids Cook-Off knows how much Sabrina loves Julia — and how she considers Julia her “alter-ego.” Sabrina’s impression of her is one even Meryl Streep would admire.) However, I have little doubt that the wedding industry also inspired my little Julia. I am so appreciative to my clients and my colleagues. 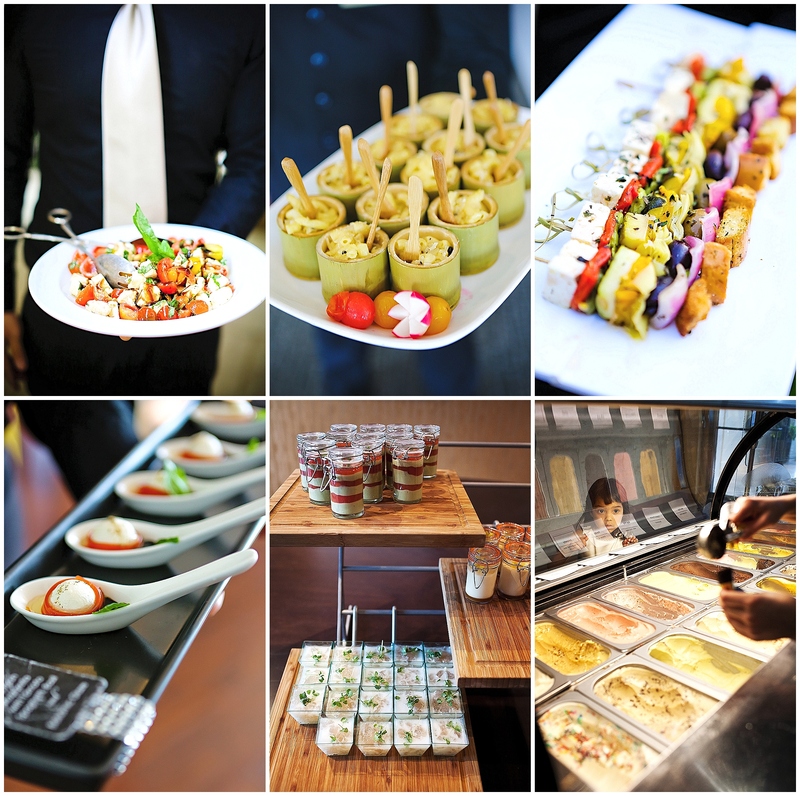 Without your stunning weddings, your (delicious!) menus, your pretty menu cards and your gracious support of Sabrina in helping her prepare for this incredible journey none of this would have been possible. The event industry and clients have been enormously supportive throughout Sabrina’s desire to be on Food Network (years in the making) and during the filming and now airing of the show, I couldn’t ask for a kinder, nicer and more supportive group. 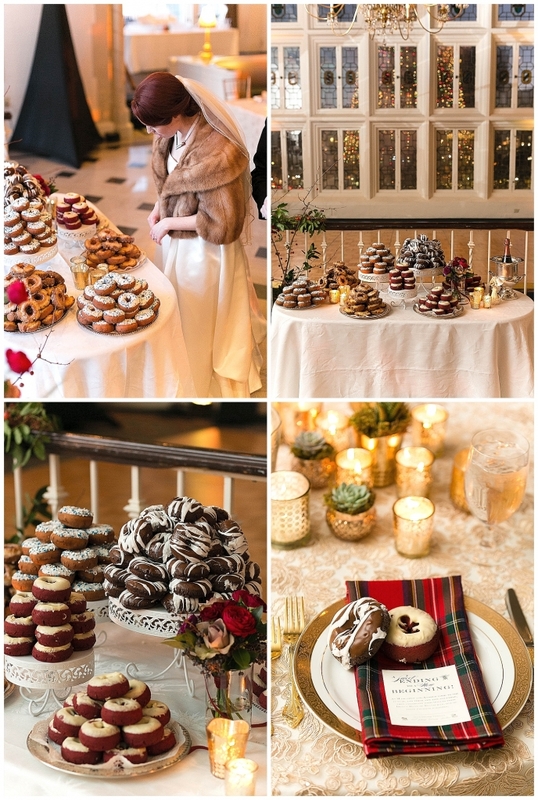 Whether you snapped a photo of her, her food the bride’s food (and made sure you texted it to Sabrina during the wedding) or sent a pile of menu cards to Sabrina after other client’s weddings (I’ve had other planners and stationery professionals do that too!) It hasn’t gone unnoticed – it all means so much! Merci – and of course, Bon Appetit!